Fishing Report August 30, 2012 Jeff Sundin - Sometimes while we're fishing, I talk with my customers about simple things in life. You know, it's the kind of chat that starts out as small talk and then eventually leads into some serious conversation. No, we didn't have that conversation on Wednesday, but without realizing it was going to happen, I stumbled into a chance to fulfill one of my hearts desires. It probably won't surprise you to hear that there are a lot of folks out there who think I have a dream job. In fact, I've heard it from people three or four times this week already. Usually the conversation comes and goes kind of fast, ends with a chuckle and we go on about our business. Sometimes though, it goes a little deeper. Sometimes I get to tell them about the things that they get to do, that I don't. Like shuffling down to the dock, hopping in the boat and spending a relaxing day aound the Lily Pads with a bobber. I used to love that! But, big time pro fishing guides gotta stay on top of the Walleyes or keep up the search for trophy Pike. No relaxing around here, ahh... if only I could re-live the old days. Guess what? Shawn Schminkey and her dad "Bud", changed all that. At least for one day, I got to re-live the simple pleasure of poking around the lake with nothing better to do than wait for the bobber to go down. When they first told me that they didn't want to go fishing unless we could spend the whole day bobber fishing, it sounded like a limitation. I started thinking about all kinds of fancy places to go and brilliant strategies for trophy fish. I was really worried that I've never be able to show them a good time unless I could somehow combine bobber fishing with big time pro guide fishing. That is until I met them and we had a chance to chat. All they wanted to do was go fishing. They didn't care for what, they didn't care where and they didn't care if the fish were big or little. They just wanted to have fun and if Bud could have just one request, all he really wanted was to have a real "shore lunch", that was it. Okay then, since it is a fishing report, I guess I better tell you what we did; We tied on 1/16 ounce jigs, clipped on the bobbers and added a medium size fathead minnow. I have a bunch of Thill's combination bobbers, the ones that can be rigged as a slip float or a snap on. We weren't planning on fishing deep, so I didn't use them as slip floats, we just pinned them on the line, set for about 4 feet deep. Just to make it easier to search for good fishing spots, I used a 1/16 ounce jig tipped with a 2 inch Shad body. That way, I could cast toward the weed edges and discover little pods of fish. Whenever I did, then we'd linger in the area and let the bobbers do their thing. We never fished deeper than 8 feet and spent most of the day in about 6 feet. The weeds were holding Crappie, Sunfish, Perch, Bass, Pike and even a couple of small, but delicious Walleyes for the shore lunch. Now I'm the first to admit that most of the fish were small ones. But every once in a while, WHAM! someone would get a good one. It turned out to be a blast. Bud reminded me a lot of my Grandpa when he said; "They're all good ones. Some are just bigger than others" Grandpa was that way too, every fish was a good one, every catch was a job well done and every time the bobber went down, there was a smile. Okay then, I admit it, some days, like today, this is kind of a dream job. But shssh.... don't spread it around, it can be our little secret! Fishing Report August 29, 2012 Jeff Sundin - Well here we go, it's time to see if the Full Moon can live up to all of it's hype! With stable weather and less than 48 hours to go until the Moon goes full, there's never going to be a better time to find out! All fish appear to respond to this particular full moon period. But for me, Musky and Northern Pike are the two that seem to be the most influenced. Later, the full Moon of September usually produces a spurt of Walleye action too, especially noticed by fishermen who prowl the water at night. The weather forecasts for the next several days include more calm, warm weather and maybe a lot of sunshine. So it's possible that early mornings and late evenings are going to be keys times, especially for Pike and Musky fishing. Looking at my calendar, I may not be too involved with any particular "big game hunt", but I'll be keeping my ears and eyes open for any opportunity to provide a little bonus for the folks that are fishing with me. I'd be really interested to hear about your experiences over the next few days too. With Labor day weekend and the full moon riding in together, there should be plenty of eyes and ears out there on the water. August 29 , 2012 - On Lake Winnie and Cutfoot Sioux - The Walleye on Big Winnie are biting, but they are definitely on the move. After a long period of stability, fish that spent the warmest days of summer around the abundant deep weeds have begun to explore new territory. Since water temperatures began to cool, deep breaklines along the shore and mid-lake bars have become inhabitable again. There is no longer any sign of Tulibee die offs and even though they haven't gone deep, the cooler water has allowed them to move away from the shallow weeds. Pike and Musky fishing has been especially good on Big Winnine this summer. The full moon, on its way, might help give some of our guests a reason to hoot over the Labor Day weekend. The biggest news of all has been the Panfish Action. Crappies and Sunfish have gathered to ... Read >> Bowen Lodge Walleye fishing report . 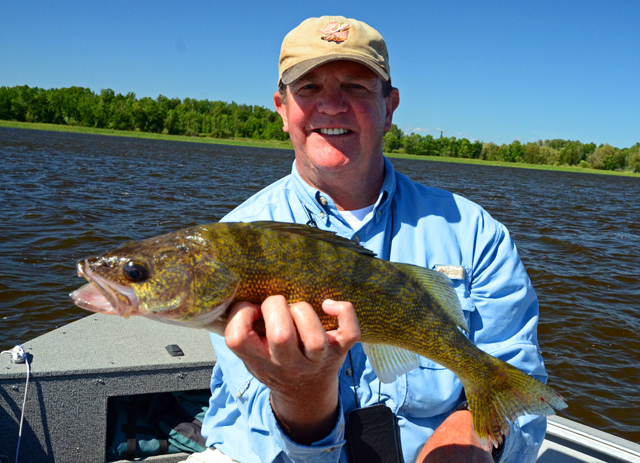 (8/29) Finding Walleyes on Lake of the Woods, is one of Jon Thelen's special talents. He's found 'em again this week and has the video to prove it. Now it's all loaded up and if you're ready to lean more about trolling for Walleyes in late summer, just click to view >> Late Summer Trolling for Walleyes . 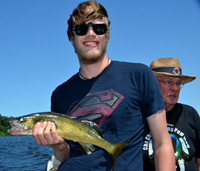 (8/29) While we're on the subject, AIM PRO, Sam Anderson, lands Giant Walleye on Lake of the Woods; A news release from the Lake of the Woods Tourism bureau says; "AIM Pro Walleye anglers hit LOW this week and pulled in record catches. Sam Anderson won the 2 day tournament with over a 7lb average per walleye for 14 fish. On the first day, Sam had 4 of his 7 fish over 29 inches. Rick Olson caught the largest walleye in AIM history with a 32.75" walleye weighing in around 14lbs. Anglers are catching fish on crankbaits, crawler harnesses and jigs. In front of Pine Island, Zippel Bay, Long Point, Knight and Bridges and by Stony Point are all producing. With so many fish in the system, "no man's land" in the mud basin in open water is also holding fish. Most fish coming from 30 - 33 feet. Colors: gold, pink, white, firetiger. Lots of saugers being taken as well. At the NW Angle, with the passing cold front, water temps went from the mid 70's down to mid 60's this week. This turned on the big fish. Trophy walleyes, northerns and muskies were active. 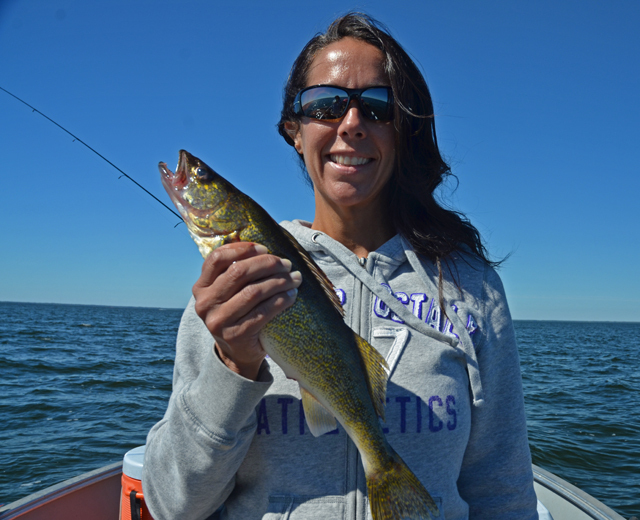 Walleyes are coming off of larger island points with steep drops and the target depth is 30 - 40 feet. Larger fish being taken on crankbaits and harnesses. 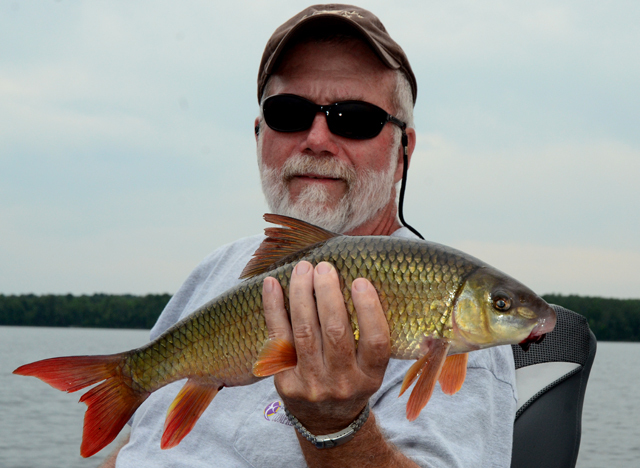 Jigigng with a minnow is still the most common method and 100 fish days still happening. Musky anglers are seeing up to 20 fish per day. Crappie fishing is picking up near cover or suspended at 20 feet. Fishing Report August 28, 2012 Jeff Sundin - I don't know how to put this without getting somebody upset, but all of this nice weather is killing me! High blue skies, calm seas and gorgeous sandy beaches are making me feel more like spreading a blanket on the beach, than trying to trick sleepy fish that are already enjoying their nap time. Don't get me wrong, we're catching enough fish to make everyone smile, but when I think of what a little windy, cloudy weather could do for us right now, it makes me feel like we're missing out on some great opportunities. On Monday, we paid a return visit to Cass Lake. The surface temperature was 75 degrees and there was just barely a ripple on the lakes surface. The setting was almost as beautiful as it can get; Dozens of Loons are now gathering for the fall flight and spent the entire morning sharing their soft "hoot" with us. 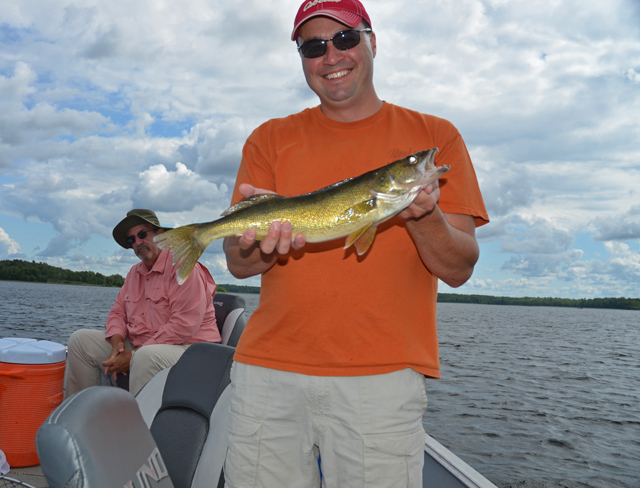 Walleyes are beginning to gather on some of the points along the larger, main lake bars. It wasn't too hard to find small packs of fish on these key locations and it wasn't impossible to catch them either. It was just a little on the slow side, typical for this kind of day at this time of year. The fish we did catch, were found in about 15 feet of water and the old standby, Lindy Rig with a Night Crawler was all the bait we needed. Like always, I use the worm blower to give the crawlers a little shot of air, mainly to help keep them out of the sand grass, snails and clam shells. We caught a few Perch along the edges of the bars too, but without a breeze, my attempts to get a good action bite going, just weren't paying off. (8/28) Bemidji Lakes Area, Paul A. Nelson, Bemidji Area Lakes Guide Service says; "Labor Day Weekend is the last big weekend of the summer tourist season in the Bemidji area. Many schools are already open and more students will be heading back to classes in the near future, which will reduce the number of families visiting the area. The August full moon is this week, which gives anglers the option of going out after dark to fish for species prone to feeding at night. Most anglers pursue walleyes when they fish at night, but muskies and other species are also know to feed at night. The full moon provides enough backlight for fish to be able to look towards the surface of the lakes and see their prey silhouetted by the light of the moon. Most anglers use surface baits or shallow diving lures at night, so they are in the right zone for the fish that are feeding towards the surface. Larger lakes are usually the best lakes at night, because there are longer stretches of good trolling water for anglers to fish. Anglers usually don’t want to have to make sharp turns or troll a tight breakline at night, so they are constantly fouling baits. The day bite for walleyes has been pretty good on most of the larger lakes. Surface water temperatures are holding in the low 70s, so most fish are still in their summer fishing patterns. 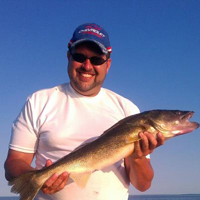 Anglers have been using several presentations for walleyes, depending on their preferences. Anglers still fishing spinners and live bait are still having success, but other anglers have made the switch to jigs and minnows or live bait rigs with night crawlers, leeches or larger minnows. 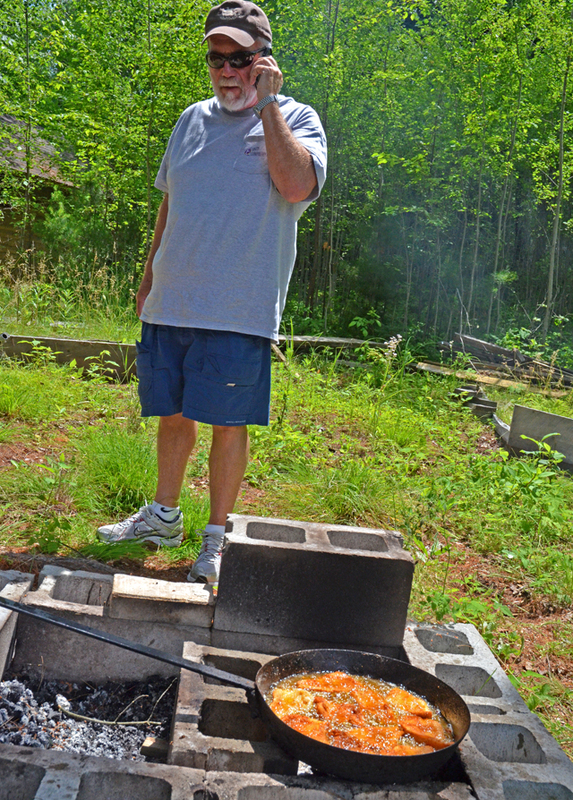 (8/28) On The Iron Range, From Greg Clusiau Has been out on the road again over the past weekend. Greg and some of his fishing pals headed North for some Lake Trout. Greg said; "The Cedar Narrows Road can be adventurous in it’s own right, as logging trucks have the right of way and wildlife abounds. Driving it during the dark can be dangerous, with moose making generous appearances. Although we were traveling the route after sunup, we still had to ... > > Read Greg's Full Report . 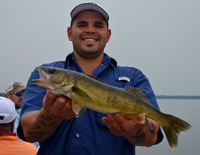 (8/28) On Lake of the Woods, Border View Lodge, Mike Kinsella wrote; "Size matters when it comes to Walleye, and Lake of the Woods has great diversity! We have been catching many trophies and, along with that, we are catching sizes all the way down to this year’s hatch. Great eater (16-18 inch) limits to take home and to have a freshly prepared Walleye meal, while you are here, has been the norm. Down rigging has become more predominant for those looking for steady all day action. We have been concentrating on t he 30-31 foot depths of Big Traverse. Bait fishing out in front of the light house gap has produced some good reports in 24 feet, while anchored and jigging. The weather is looking great again with highs into the 80’s and lows into the 40’s. We are excited to see how thi s year’s shiner run turns out, as the temps are cooling down over night. There has already been some speculation on this year’s run, but at this point we will just call it bar talk. The water temp is now at 69.8, so we have a ways to go. The fall fishing is fast approaching, if you are thinking of making a trip, it is a great time to take advantage of the fal l specials. Fishing Report August 27, 2012 Jeff Sundin - High, blue skies and a blustery West wind helped send my game plan back to the drawing board on Sunday. Lucky for me, WE HAD A BIG DRAWING BOARD! One day after hearing about some great Northern Pike and Musky action, our hopes were high! We really thought that we could get out and bag at least one nice Pike for Paul. His goal was something over 30 inches and the way things were going, all indications were good. But a day makes a big difference and just one day after having a set of perfect fishing conditions, this one would offer the complete opposite. When we arrived at the West side of Lake Winnibigoshish, the wind was blowing out, away from shore and the surface was calm. I didn't expect this, but the 74 degree water was crystal clear, I mean Gin clear. We could easily see the bottom in 10 feet of water. Every weed, every ripple in the sand, everything. The whole cast of characters from Saturday's story were already out there. Musky Dave was casting in the same spot where we'd left him on Saturday evening. Joe, Phil and Roger were over on the West side already casting, their hopes were high too, especially after Phil's performance the day before. It was all going according to plan except there were no fish. They never got the memo and instead of a morning filled with yippee and hoots, it was a morning filled with moving, experimenting, adjusting and finally, moving on to a new plan. We were lucky that Joe's crew had saved enough fish on Saturday to provide for the Shore Lunch. We went ahead with our game plan and gathered for a fantastic meal (if I do say so myself) of Blackened Pike and some good old fashioned fried fish too. Next stop, the Crappie hole and yes, another learning experience, This time though, with a much happier outcome! After we trailered up to a new starting spot and put the boat on the water, we discovered surface temperatures ranging from 74 to 76 degrees. It depended on where we stopped and how protected from the wind the areas were. Knowing that mid-afternoon on a sunny day wasn't the best time to start this mission, I roamed around looking for "new fish" because many of the fish that moved deep after the last cold snap, had already been discovered and pursued by a number of other anglers already. We did manage to locate a few small packs of fish, but during mid-day, some half heart-ed bites resulted only in some missed fish and small Perch. Time for a new strategy, we decided to move into the weeds to try for Sunfish, but guess what? Before we could catch our first Bluegill, a Crappie, then another and another. Hmm, it looks like I stumbled into some new fish after all! The school of shallow water fish started us marching down the path of a new learning curve, but eventually, learn we did and production was going into high gear! The learning curve involved getting the hang of fishing a 1/16 ounce jig tipped with a 2 inch shad body. The trick is to let the shad do all of the work. For a lot of us, that's hard, because we're used to jigging aggressively for Walleye and other game fish. We're used to moving the bait a lot and sometimes fast. In this scenario, short casts toward the weeds, followed by a lot of time to let the jig sink, then s-l-o-w-l-y swimming the bait back toward the boat did the trick. So did slow trolling and even drifting. The key was getting the speed right; so if you're headed out to give this a whirl, spend your time experimenting with your retrieve or drift speed. We were having fun with the Crappies, so we didn't try to fine tune the presentation for Bluegills. But we did catch a handful of those on the jig and shad combination too. That made me think that there were probably a lot of Sunfish in the neighborhood too and small pieces of cut worms could have added more of them to the larder. Key depth was 7 feet, but we caught some fish as shallow as 5 feet others as deep as 9 feet. The weeds were important in terms of where the fish were holding, but the stiff West wind gave the fish an excuse to roam out into open spots. Fishing in the heaviest weeds was not necessary this time, but if it was calm, you might have to go in and root 'em out. Overall, the day was spent searching and head scratching, but I'm glad we hung in there. If we'd given in, given up and headed for home, we would have completely missed the most rewarding evening of fishing I've seen in a long time! Not to mention a very, very lucky sunset! Fishing Report August 26, 2012 Jeff Sundin - Moon phase effect? Hurricane effect? Just good luck? Who knows exactly what triggers some of the cool occurrences in fishing, but whatever the cause, something's happening because there are some really, really cool occurrences going on right now! Just like it does almost always at this time of the season. That was before I talked with my good friend Joe Thompson from Four Seasons Resort on Lake Winnibigoshish. I was smiling, but his day was going even better! Joe was fishing with one of his regular customers, Phil Jensen who comes every year and almost always fishes for Northern Pike and Musky. I've fished with the group in the past and I've been there when Phil has made other good fishing announcements, but this one is the best that I know about. On a routine day of fishing for the team, Joe managed to park the boat in a good spot and Phil took advantage of it by capturing a 52 inch Musky. In a conversation with Joe after the fish was released, they estimated the weight of the fish at somewhere in the 40 pound neighborhood. Making the story even more interesting, is the fact that on Friday, another one of Joe's fishing buddies caught a 51 inch Musky in almost the exact same location! Hm-mm ... makes a guy wonder? Lucky for me, I don't know where, but I do know this, I'm gonna be cooking lunch for those boys today and I might just slip something into Phil's plate of spuds to help loosen him up a little. You know, make him feel good about answering a few innocent questions like; Can I please have the GPS coordinates? We'll see what he says. What I can tell you, is that the fish hit a Suick and so did a whole bunch of Northern Pike. Joe said that they caught and released a couple of dozen Pike. None of them were giants, but there were a lot of nice, scrappy fish in the mid to high 20 inch range. For me, catching the Pike is a great way to prevent boredom while you're waiting for a chance at that big Musky. Walleye fishing on Winnie was good on Saturday too, or at least it was good for us. We repeated the deep water, main lake bar pattern that worked on Friday and for the first time in a long while for me, the same pattern worked, for two days in a row! Fishing the lakes giant bars isn't too complicated, almost everyone with a boat can do it. Lindy Rigs tipped with Night Crawlers and fished on the breaklines will eventually put you in front of some fish. Just keep your trolling or drifting speed under control. I love to drift, because it keeps all of the lines in handy position for rigging. If it's breezy, I'll use my Drift Control Wind Sock to help keep the speed down. I like a drift speed between .6 to .8 MPH and if the wind makes us drift faster than that, I switch to back-trolling instead. Moving along the edges of the bars and watching your electronics for a school of fish will speed up the process, but I'll warn you now, there are a lot of signs of life out there and with so many baitfish, schools of minnows and assorted other species of fish down there, you might have a little trouble deciding where to stop and fish. I decided to stop confusing myself and instead of trying to figure out which of the fish I was marking would be active, I started picking out the likely hiding places instead. It seemed like most of the key features like inside turns or small points were holding some fish. They were active enough that one pass through an area was enough to reveal which ones were Walleyes and which ones weren't. The depths varied from 15 to 19 feet depending on the spot, but generally, fish were holding closer to the top edges of the bars, not deep on the breaks. This wasn't the only game in town; I know that there were still some anglers out there who were using spinners on the weedlines. They were still catching fish too, but if you're going to fish the shallows, keep in mind that several areas have been hit hard for the past few weeks. The guys who like to play Amerigo Vespucci and explore new territory will be the ones who stumble into the next big school of fresh fish. (8-26) Q) My question is regarding the Opti Max and trolling. How do you find the Merc 2 stroke trolls? Do you do any trolling with the big motor? A) Brett, this is actually a great question. I just took delivery of my fourth Opti-Max, 90 HP Tiller and for me, these smaller size OptiMax engines have been one of the best keep secrects in the fishing engine market! My first Mercury/Alaskan package was a 20 foot Alaskan with the 115 HP Mercury Four Stroke. That engine ran like a top, started great and was a really nice match up for that boat. But, everything that I could do with that engine, I can do even better with the OptiMax. As it happens, I'm just wrapping up the break in period on the new rig right now and the 90 HP Opti, paired with the 18 pictch Vengeance prop, cruised my rig along at a comfortable 36 MPH on Friday (8-24-12). The really good news is that the Opti trolls even slower than the four strokes do and with a light chop, I can backtroll at around .9 to 1.0 Mph. If I throw out the Drift Control Sock, then I can creep along at .5 to .7 MPH without any problem at all. The Opti's are very easy on fuel, get the boat up on plane faster than do the Four Strokes and It's really, really nice for getting the boat on the trailer at the end of my fishing trips. The extra torgue allows me to walk the boat right on up the rollers, without having to go into high RPM's. That's a really big deal when you're at shallow boat landings and you don't want to cup your prop on the bottom. That's where most of the prop damage occurs, and for me, it's been virtually eliminated since I switched to the Two Stroke. Truthfully, you'll be happy with either engine. But if you're leaning my way anyhow, then you'll be glad to know that the Opti would be a fantastic choice for your new rig. I know that you've read some of what I've said about the Alaskan's in the past. So I'm sure you know that for me, it's the absolutely best rig that a multi-species, multi-purpose outdoorsman could ever ask for. It's all business, no frills, but everything I ask my rig to do, it does, with a smile! 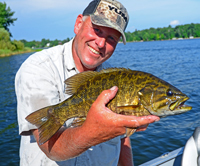 Fishing Report August 25, 2012 Jeff Sundin - More summer weather, stabilizing surface temperatures and a late summer shift in Location for Lake Winnie's Walleye. But first, a quick note: I've had a scheduling glitch and find myself with open dates on Labor Day Weekend. There were a few surprises in store for me as we began our fishing trip on Friday. Some of my "old stand-by" Crappie spots, now have new owners and some of the fairly reliable, "back-up" spots had already been worked thoroughly enough to thinned out the populations of hungry fish. In other words, getting the trip off to a quick start with an early burst of Crappie action, turned out to be more like pulling teeth. Luckily, I had plenty of time and the full cooperation of a patient, engaging customer. Walleye fishing was on the agenda too and realizing that the sun was getting higher, and the wind was getting calmer, we figured it was time to hit the big lake and start prospecting for Gold. With the sunny and calm conditions, I already had in mind that we'd have to do some experimenting to find out where the fish were hiding. Everyone on the Deer River side of Winnibigoshish has known about the weedline bite on the lake's East side for a couple of weeks already. Anglers who have fished there during the past few days, knew also that it had been steadily tapering off. Still, we had to at least take a quick look for a school of stragglers. After a couple of stops at some of the off-beat weed patches, we'd only produce one "slot-fish" and a bunch of sub-miniature Perch. Next stop, out further on the flat in about 16 feet of water, not much there. Next stop, in closer on the flat, about 12 feet of water, not much there either. Next stop, up to the rocks, hmm... a little progress, we picked up a couple of keepers and a slot-fish there, but it fizzled out. After an internal debate, I decided to let a small group of boats lure me over to the Bena Bar. We headed South, rigged up with the old standby, Lindy Rigs, 3/4 ounce sinkers and plain hooks tipped with air injected Night Crawlers. Our first taste of success didn't come right away, but it did come. A small, but active school of fish were holding along a slight inside cut in about 17 feet of water. We made three or four passes on this spot and managed to move a few numbers into positive territory. Four keepers along with a few more slot-fish gave us the confidence to keep searching for more. We moved about a mile outside of the crowd and started looking for some more fish. The Humminbird revealed fish, scattered and small, but in the strike zone, about 16 feet deep along the top edge of the bar. Once we started fishing, everything I saw on the graph turned out to be true. There was a school of smaller fish, just barely keep able, but the modest 14 to 15 inch fish would be perfect for a fish fry at the end of the day. By now, I was busy sharing good news and comparing stories, while I watched John catch the rest of the fish. You could say it was the perfect ending to our day. We worked for the fish we got, but in the end we did get what we were looking for. By now, I was thinking about panfish. Since we still had a little time to head back for the resort and pick up John's wife, we opted in for a short trip onto Little Cutfoot. Once we got there, we found a surface temperature of 78 degrees. Way too warm to expect the fish to be located out in open water. But I took a little look anyway and found so much bait and clutter on the the graph that I could never have decided where to stop. Instead, we started checking out the weedline and things went a little better here. It was a modest catch, a few eating size Sunfish, a handful of small Crappies, but a few keepers too. In that short 1-1/2 hour of fishing, we did learn that there are fish to catch and that they are still located in the fairly heavy weeds. With a little more time to work on the baits, I do think we could have fine tuned our presentation and become productive. No matter how you look at it, the brief evening excursion was well worth the time spent and I'd definitely keep it on the back burner as a backup plan! Fishing Report August 24, 2012 Jeff Sundin - Ah Ha! We caught summer creeping back in to the Deer River area on Thursday. Along with the warm summer weather, rising water temps triggered something of a slow down in the fishing action. Not enough to shut it down, just enough to make it tricky. When I met my friend Bill Linder and his fishing partner Tom at Fred's Bait yesterday morning, I gave them a couple of ideas about what we might expect when we got out on the lake. With warm, sunny weather on the way, I told them that I thought whatever we did first, would be our best effort. If we went after Crappies first, we'd probably get them. 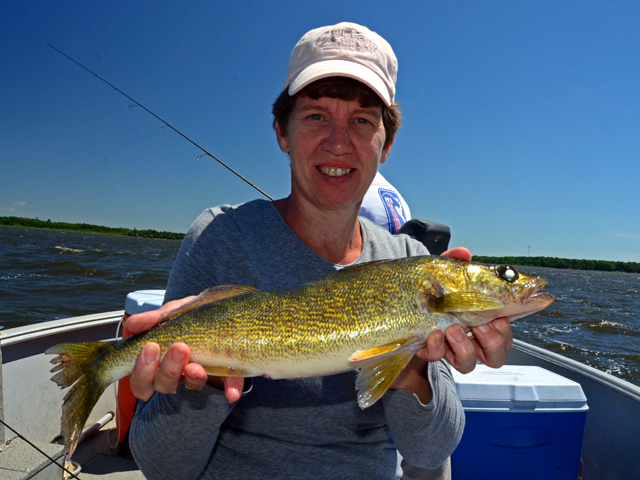 If we first sought to catch our Walleyes, we'd probably get them too. In either case though, whichever we decided to pursue in the warm, afternoon sun, might be what we'd fail to catch. Knowing Bill, I already expected that he'd tell me to do whatever I wanted first and he knowing me, probably had already figured that I'd head straight for the Crappie hole! So as long as we both KNEW anyway, then why ruin a perfectly good thing by over-thinking? We both did what the other expected and it turned out to be a great idea. The Crappies were cooperating and as far as we knew, we were golden. Except for one thing; At about 11:00 AM when we were already well past halfway to our Crappie limit, Bill texted home; "Don't take anything out of the freezer, Crappie for dinner". The reply from home was simple, but effective; "Rather have Walleye". So there ya go then, a third scenario, one that I hadn't written in to the script. How about if we settle for the Crappies we already have and head out toward the Walleye hole to capture tonights dinner? I'd gotten a heads up from a fishing buddy about where the Walleye fishing had been reliable and he let me in on his secret about what the best baits were too. So we headed for the East side of Lake Winnie. It was easy to see where everyone had been fishing, a line of boats strung out for a couple of miles along the shoreline. I stopped short of the crowd, got out the rods that still had the Crawler harnesses rigged from Wednesdays trip and started re-rigging them. While I was doing that, I fugured someone might as well be fishing, so I stuck a crawler on the Purple Smelt Lindy Spinner and handed it to Bill. Before I ever had the second line in the water, he was reeling in a Walleye. It was an exciting moment for him, thinking that already fulfilled his pledge to return home, food for the table in hand. Until he remembered the slot limit: "Oh that's right, this one's gotta go back", he said as the hefty 19 incher slipped back under the surface. The next one was a keeper though and so was the third one. So if Bill was catching fish on the Purple crawler harness, why was I switching the other rigs to sngle hook minnow rigs? I got Tom back into the game by getting him the same bait Bill was using and eventually, I got one set up too. From what we saw and heard out there, the crawler harnesses were performing at least as well and better than most of the other rigs that fishermen were dragging around out there. The warmer it got, the slower the action became and although the fish never actually quit biting, they never got really got into a feeding frenzy either. We just kept covering ground, chipping away at the small, scattered groups of fish. By the end of our trip, we had a mixed bag of half our Wallyes and something over half of our Crappies. Not the best day we've ever had, but certainly far from the worst. The Walleyes were located in about 9 feet of water, well outside the weedline. In fact, I attempted to catch fish by hugging the weedline, but that didn't work. We only caught them when I let the boat roam out onto the flat. Earlier, the Crappies were located in small, scattered packs along the breakline. 16 to 20 feet was the key depth, and simple, 1/16 ounce jigs tipped with minnows was all we needed to catch them. Fishing Report August 23, 2012 Jeff Sundin - You know how sometimes you go fishing on a lake and it works out so that you just sort of take natural liking to it? Sometimes they wind up becoming favorite lakes and you can hardly wait for your chance to go back. I know it works for me, and I know that sometimes my customers have it happen too. Whenever I'm fishing with someone who has had really "good luck" on a certain lake, I look for a good reason to re-visit that lake when they're here. If for no other reason, it gives them a confidence boost and makes them feel like it's going to be a g trip, even before they drop a line in the water. On Wednesday, that's what I did with long time friend Julie Mills and her boyfriend Larry. We've had good trips on Cass Lake in the past, and since I've been chomping at the bit for an excuse to get over there anyway, this was the perfect time to check it out. When we arrived at the lake, The surface temperature was 69.9 degrees and would eventually tip back over the the 72 degree mark by early evening. The combination of bright, sunny skies and light breeze wasn't the best news we've ever had at the beginning of a Walleye trip, but it was absolutely gorgeous to look at. We started prospecting some of the lakes numerous mid lake structures. A couple of humps and a couple of mid lake bars later, I stumbled into our first sign of action. A point that extended out from a long bar held a small, but active school of Walleyes. They were sitting on top of the point in 19 feet. Later, I ran into another school of fish on one of the mid lake humps. These fish were slightly deeper, 20 to 25 feet, but were equally active. Trolling Lindy's Crawler Harness Spinners, we had a variety of colors in the water, but the fish seemed to have a sweet tooth for the Purple Smelt color. One by one, I switched all of the rigs to that color and each time I switched one, it was soon vised by a Walleye. It's hard to argue with success, so I stuck with that color pattern for the rest of the day. The fishing action for us was far better in the morning than it was later in the day and by around 4 PM, finding fish on the Humminbird was no guarantee of getting a bite. We didn't stay late enough to learn if there was an evening bite to work with, but as we left the lake, I talked with Chad Benson, who mentioned an alternative that may have worked better for me. 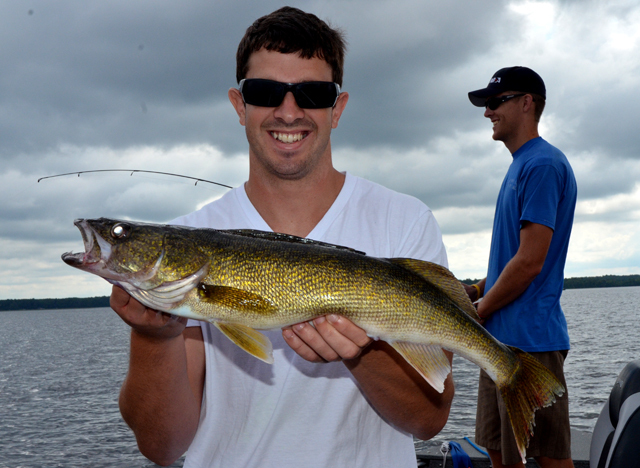 Chad has been finding his Walleyes in shallower water. When it's calm, he's trolling spinners in the 10 to 14 foot range. With a breeze, he prefers switching to a Lindy Rig instead. When there's a good drifting wind, he believes that the Lindy Rig is more efficient at keeping the bait in front of the fish. He's probably right. Chad also mentioned that Perch are beginning to get active, so anglers looking for some faster action could start searching the lakes flats for roaming schools of Perch. 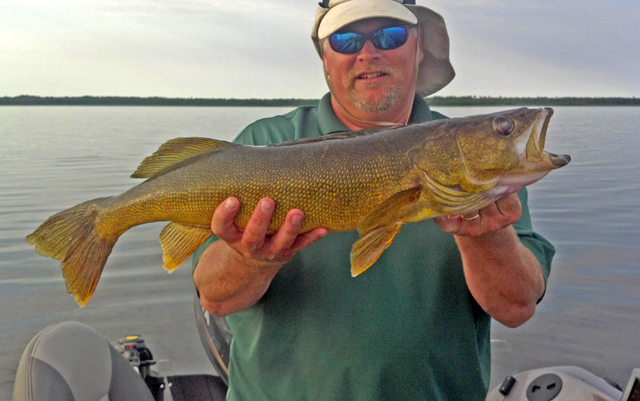 (8/23) Northland Lodge, Mike O'Reilly reported an easy morning of Walleye fishing and said; "It's Been a long time since I got a limit of Walleyes this fast". Fishing on lake Winnie's Eastern shoreline, anglers are picking up fish using spinners tipped with minnows and also night crawlers. There are some Northern Pike using the same weed edges too, so multi-species fishermen and try fishing the shoreline with crankbaits and jig and minnow combos too. (8/23) From the Park Rapids Area, Jason Durham delivered his Fishing Report; "Fishing in the Park Rapids, MN area has been stable despite recent variations in water temperature and weather. Cool nights have caused surface temperatures to drop 12 degrees in the past 14 days and some high winds have affected water clarity and weed growth. Clarity has diminished on some of our lakes and floating weeds are notable. Some days you will see piles along the shorelines and in front of public launch areas. Understand that this isn't the actual "turn-over" of our lakes, but it is an indicator that the process, which takes several weeks, is in motion. The panfish bites has been strong and the bluegills and crappies are definitely biting. 6-12 feet of water has been best and small jigs tipped with plastic bodies, like Northland Tackle's Mimic Minnow Fry and Impulse line of soft plastics have been productive. No need for live bait, the forage emulating soft plastics tempt both sunfish and crappie. 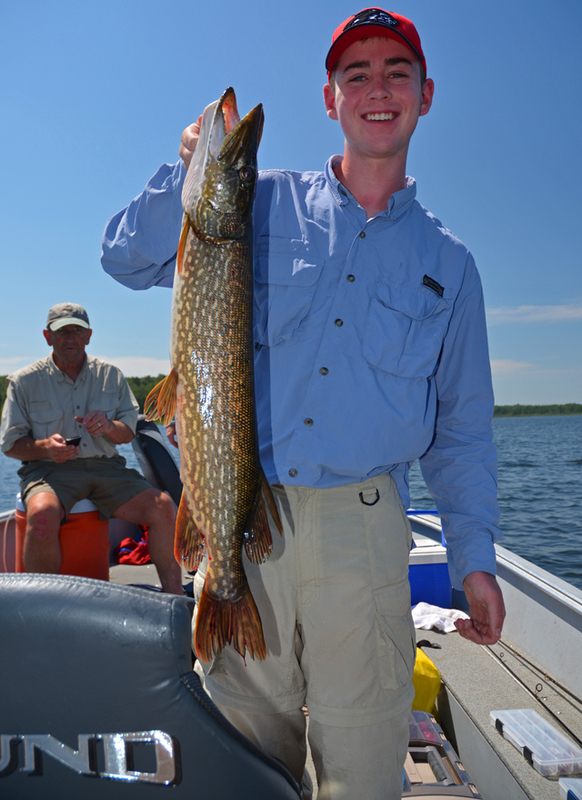 Northern pike activity has fallen slightly, though some nice fish are still being caught. As the water cools, expect the pike to become increasingly active. A medium sized sucker minnow attached to a 1/2 oz brightly colored hair or feather jig in 10-16 feet of water is tough to beat. Muskies have been active and some dandy fish are being reported by anglers. Some of the traditional style baits are working well, like Bionic Bucktails, Reef Hawgs, Bulldogs and a wide variety of topwater baits. The key is to go early and stay late. Walleye action has been stable and most anglers are using crawlers on a spinner or Slow-Death rig. Typically walleyes would be biting well on redtail or creek chub minnows during this period, but the availability of the river minnows is scarce. Leeches have been working too, but finding decent sized leeches is also difficult. Crankbaits trolled in the mid-depths has been productive in the low-light periods." - Jason Durham, Go Fish! Guide Service, Inc. 218-252-2278. (8/23) Bemidji Lakes Area, Paul A. Nelson, Bemidji Area Lakes Guide Service says; "Lakes in the Bemidji area are hovering around the 70 degree mark, so anglers are still able to use summer tactics for walleyes and other species of fish. Anglers have been using spinner rigs for walleyes, with bottom bouncers working better for deeper water and bullet sinkers and spinners working better for walleyes in shallower water. The walleye bite in the deeper lakes like Bemidji, Cass, Plantagenet and Walker Bay of Leech Lake has been on the sides of structure in 12 to 18 feet of water. 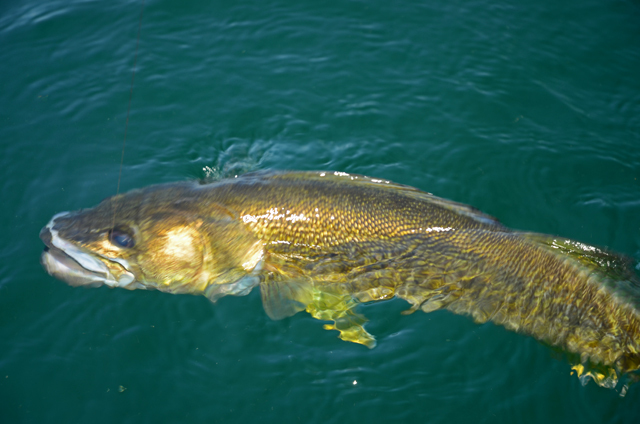 Walleyes in shallow lakes like Upper Red Lake, Winnibigoshish and the shallow bays of Leech Lake have been moving back into shallow water, with many of the “eating-size” walleyes in 6 to 12 feet of water. (The water levels in Upper Red Lake are very low, so some anglers have been having trouble accessing the lake with larger boats). Anglers are also finding perch in shallow water, with many of the perch in similar depths or slightly shallower than the walleyes. Bass, crappies and sunfish have also been active in many lakes. Bass have been using heavy cover in most lakes, with more bass moving to the outside edge of the weeds and gathering in schools as the water temperatures cool. Sunfish have been using the edges of heavy weeds like cabbage, coontail and northern milfoil. The greenest, healthiest patches of weeds are usually the most attractive to sunfish. Crappies can also be on the edges of the weed beds or they can be on deep rocks. Crappies usually bite best during low light periods during the summer, but they will bite better during the day as the water cools. Muskies and northern pike are also active in the fall, with tulibees usually the key forage. Tulibees are one of the few species that spawn in the fall in the lakes, with many of the larger gamefish following them into the shallows." 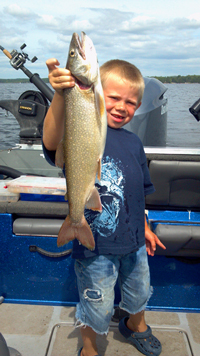 - Paul A. Nelson, Bemidji Area Lakes Guide Service, panelson@paulbunyan.net 218.759.2235 . (8/23) Grand Rapids Area Fishing Guide, Jason Green Checked in and says; "Cool nights and warm days have water temperatures dropping quickly. In fact, in the past week and a half surface temps have dropped 10 degrees now. With temps quickly decreasing late Summer/early Fall patterns are beginning to emerge. When the wind is blowing our best presentation has been a Baitfish Image Spinner with a crawler in roughly 8' of water. Fish have been staying pretty close to or in mature vegetation. The most productive blade colors have gone from the traditional Hammered Gold to just about anything bright such as Sunrise and Yellow Perch. When the wind starts to lay down fish are tending to move out of the shallow weeds and can be found anywhere from 12'-18' of water. Pulling Cranks on the outside weed edge have also been producing at roughly 2.4mph. Once fish are located we are switching to a 1/16oz jig tipped with a crawler and work the area thoroughly". - Jason Green >> Upnorth . Fishing Report August 22, 2012 Jeff Sundin - Well okay then! We got all of my Katie's stuff moved, spent a little time getting her apartment put together, spent a little time at the new school and then made our way back home. I'm ready and chompin at the bit to head back onto the lake today, in fact we're gonna start early this morning! While I was away, the Winnie Walleyes played cat and mouse with me again. Reports from Tuesday on the big lake were really good. It's because of the great breeze that blew on Tuesday. Walleyes are gathered up and ready to bite, so a good breeze and a little current under the surface is all they need to trigger a good feeding frenzy. Calm days are still tough, so plan on branching out in different directions when the lake looks glassy. As we approach the full moon, there will almost certainly be a period of hot action. Crankbaits, Spinners and fast moving jig and minnow presentations will be in the limelight. Fishing Report August 20, 2012 Jeff Sundin - Our fishing day on Sunday was about as nice as it gets! Blue sky, cool air and just enough breeze to keep most of the flies away. Our fishing story was so close to the same experience I'd written about on Saturday, that I can't find enough words to make it sound different. Just scroll down a little and read the report from 8-19 and you'll know the whole story. (8/20) On The Iron Range, From Greg Clusiau Did a little barnstorming before his summer vacation wrapped up. He's been all over the places fishing and writing. Greg said "Whew! I really packed it in, probably fishing more in nine days than the average person fishes all summer. Also, probably putting on more miles than the average Joe does in a month or two. In any event, it’s all over now and ..." click to >> Read Greg's Full Report . (8/20 On Lake of the Woods, Border View Lodge, Mike Kinsella wrote; "Another fabulous week on Lake of the Woods! It has been a really busy summer and the fishing has never been better.&n bsp; If you thought about sneaking in a trip before the fall activities start now is a great time. We have been angling different spots on the lake again this week with most of the focus towards the northern part. Do wn rigging has become more productive but there is definitely some action with crawlers and spinners. The AIM Tournament had a couple of successful days and of course Lake of the Woods produces again by providing the biggest Walleye in their circuit at 32.75 inches. We are still working with the same general forecast as last week. There are a couple days expected to get into the 80 ’s and have lows in the 50s. Perfect for that sweatshirt in the morning and evening and nice and comfortable out on the lake. Our winter rates should be posted on the website this week, it is time to start thinking about the best dates. Again this year we are adding more sleepers and porta potties to our winter fleet of houses." Sshhh... don't click here, it's just a link to 5 great Bass Rigging Techniques . A) Todd, my transom mount is MinnKota's 24 volt, 80 pound thrust Traxxis. The control head is easily reversable and the unit provides more than enough power for my 20 foot Alaskan. I can easily pull backward into a stiff Walleye chop and the simple, one finger tilt button makes it really easy to tilt the motor up when I'm ready to make a move. (8/20) Product Announcement; Just in time for the hot late summer action on Lake of the Woods and Rainy Lake; Lakemaster has just announced their new, Woods/Rainy Contour Elite Version 2 PC software. Version 2 is updated with the new survey areas around Big Island in the South East portion of Lake of the Woods and includes detailed 1 foot contours for all of Lakes Kabetogama, Namakan, Sand Point, Crane lake and more. This software is a must have for any angler who wants to catch more fish. The unique features allow anglers to pre-fish more effectively. Check out this link for Contour Elite Software Options . August 19 , 2012 - On Lake Winnie and Cutfoot Sioux - The Walleye action on Big Winnie continues to be good, but sporadic. Most anglers are keyed into 3 or 4 hot areas and in spite of steady pressure on these spots, the fish remain loked in and semi-active. Deep weeds are the best they've been in years this summer. High, clear water, warm days and a lot of sunshine have provided ideal growing conditions and there are weeds growing deeper and in more places than any time in recent history. Walleye, Pike and Perch have been sharing the territory, so anglers can expect mixed bag fishing. Panfish action is beginning to perk up too and early signs of fall Crappie action are whispering through the resort. On Saturday, Jeremy Johnson and Bernie headed out on the lake and came in with ... Read >> Bowen Lodge Walleye fishing report . (8/18) Zach Dagel, Grand Rapids Guide Service. Dropped me a line to be sure that everyone knows about some friends and customers, who are sponsoring a Walleye Fishing Tournament on Lake Winnibigoshish. The tournament is scheduled for September 8th, 2012. Click to view the flyer >> Walleye Fishing Tournament, Lake Winnie . 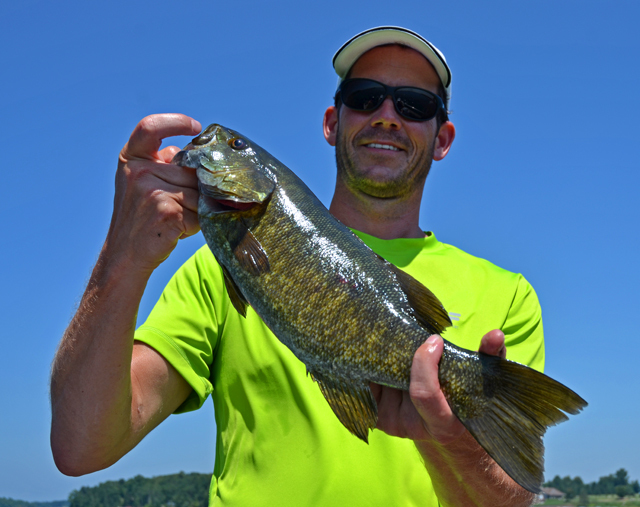 (8/18) Finding Smallmouth Bass on Lake Mille Lacs, was Jon Thelen's mission for this week. He found 'em all right and he's got a great pattern that will work for you. Readers know that I've mentioned using the Yum Dingers for Bass fishing a whole bunch of times. Now, if you want to see them in action, Click to view >> Late Summer Smallmouth Bass Fishing . (8/17) On Bowstring Lake, Erin at Geiger's Trails End Resort mentioned that the fishing has been less than stellar this week. But, there are some highlights going on out there. A mixed bag of Crappie and Perch can be caught along the weed edges. A key to the strategy is to locate areas where the weeds adjoin the steeper breaklines. Crappies are on the verge of making a move into deeper, open water. But for now they remain locted near these sharper weed edges. A good stand of Cabbage weeds will out produce any other kind of weeds, so take some time to do the investigation before you drop a bait in the water. One really great search technique is to fish with a Lindy Spinner tipped with a fathead. It doesn't need to be complicated either, a 3/8 ounce sinker and a standard, out of the package lengthsingle hook spinner will work perfect. Gold blades have been reliable, but we know that other colors will produce fish too. For Walleyes, we're watching the water temps fall, and getting suspicious that these fish are moving back out into deeper water again. Spend a little time checking the larger bars for evidence of fish. Don't give up, there may have been a little slow down, but there's a re-bound just around the corner! Erin wrapped up with; "The good news is that we have FALL rates in place for a nice get-a-way in a beautiful cabin, on the best lake in the area! Weather is still warm during the day, and cool at night". Learn more >> Geiger's Trails End Resort . (8/17) In the Bowstring Lake Area Otters Guide Service, Robby Ott Says; "The high school football season officially kicked off on monday. The Deer River Warriors have high expectations making it to the region finals a year ago. The connection here is that I am coach on the football team. So from here on out it is fishing and football until freez up. Possibly a couple of grouse hunting trips with my new pointing labs, one of which I will recieve on sat, from Ellensberg Wash. With the # 2 lab at the end of the month. Both of which come out of Tiger Mountain Pointing Labs. Anyone interested in a cast and blast weekend should get a hold of me. With that being said, Lake Winnie, right now. Edges of cabbage 10 - 12 fow. North, West and East sides of the lake. Spinners with half a crawler and Lindy rigs with a full crawlers. Good Luck and Be Safe." - Contact Otters Guide Service . Fishing Report August 19, 2012 Jeff Sundin - My first taste of fall fishing patterns began to emerge on Saturday. It was actually a really great day on the water, but in typical pre-fall fashion, when conditions were favorable, there were spurts of action. When conditions went sunny and flat though, the fishing action headed South too! When I arrived at the lake and met my customers, there were whitecaps coming onto the shoreline along Bowens Flats. All indications were that Winnibigosh was going to be choppy, wet and chilly. Fearing a wild ride out, we talked about checking out some Crappie spots while we watched to see how the wind developed. That wasn't a bad idea, we had to do some prospecting, but as we checked likely Crappie territories, we would discover small packs of fish beginning to build along the outer edges of weeds on steep breaklines. Small fish, really small, like 5 to 7 inchers were the most common. But there were just enough keepers mixed in to make it worth spending time on the project. The trick was to keep moving. Typically, I can find one large school of fish that will continue to bite long enough that we can put in a good dent in a bag limit for a couple of anglers. This time, between sorting out the small fish and working the small schools into dormancy, we were only able to pick up 6 to 8 keepers at each spot. It was like clockwork, find a new school, have great action for a little while and then see it fizzle out. The good news? There were plenty of small schools of fish scattered around the lake and we were able to find enough of them to capture a two man limit. Most of the fish I located were in 18 to 20 feet of water. But, I had reports from friends who also found fish shallower, 12 to 14 feet on the outer weed edges. Presentation was simple, 1/16 ounce jig heads tipped with small minnows was the best. Today's Crappies were meat eaters and most of my early attempts to catch them on artificials fell flat. Late in the morning, I did manage to pick up a dozen assorted size fish by using the same 1/16 ounce jig, tipped with a 2 inch shad body. By then the water was warming and the fish were chasing the baits a little more agressively. Now that we had our Crappies, it seemed logical to head toward the gap to check on the wind. Along the way, we realized that spending the morning in proteced territory had sheltered us from the knowledge that the wind had died and the big lake was beginning to go flat. We headed for a deep weed bed on the North Shore, rigged up Lindy Crawler Harness Spinners, dropped 'em in the lake and Wham! .... Wham...... and Wham! Within about 3 minutes we'd already caught 2 Walleyes and one Pike. Wow! This is going to be easy ........ NOT. Comapring notes with friends, there was good Walleye action earlier, probably about the same time we were enjoying the Crappie fishing. Had that project gone faster, of if the wind had lasted longer, the outcome for our Walleye fishing would certainly have been different. This time, we'd have to settle for one over the other and so, Crappies won out. Fishing Report August 18, 2012 Jeff Sundin - An unplanned day off on Friday gave me a chance to be completely domestic for the day. Yard chores, gardening, a little logging and oh, yes, I even spent some time tweaking that engine. I think I'll be operating at full speed today! I know I'll be finding out really soon and tomorrow, you will too! Fishing Report August 17, 2012 Jeff Sundin - I've been sitting at the computer, scratching my head as I try to get a head start on today's report. The best that I can come up with is that what could have turned out to be a fishing disaster on Thursday, wound up being a blessing instead. Following a series of overnight thunderstorms, the morning began with high winds, a trailing rain shower and slate Grey skies. Blustery, they call it. Couple that crummy weather with another limitation, a semi-crippled rig that only goes 10 MPH and coming up with an entertaining idea for my fishing guest was getting me a little concerned. Talking over potential strategies, with Melinda Hays of Fort Smith Arkansas, I just happened to mention Northern Pike. I don't know why I even asked, but luckily for me, I did. Melinda said that she'd never fished for Pike, never caught one, and for sure, never eaten one. Well okay, now we had something to work with! Promising that the fish may not be gigantic, but would likely be plentiful, we loaded up the truck and moved to .... Gus' Place on Ball Club Lake. Just like we thought, when we got there, the waves were already about 3 feet high. The air temperature was 55 degrees and there wasn't a sunny spot anywhere. PERFECT CONDITIONS for what I had promised and plenty of wind for what I told her might be her "longest drift ever". We pounded our way to the North end of the lake, rigged up one rod with a Whatsit Spin Jig and set up a Lindy Rig with a Creek Chub on the other. I protect the baits from most bite-offs by using a short length of 17 pound test, Fluorocarbon as a leader. The Fluorocarbon won't save 'em all, but it stops about 90% of the Pike from tearing off your lures. As soon as I got "limpy" in position, we dropped in the drift sock and the lines and then got ready for some fish. It took a little while for the Pike to find us, but after a short dry spell, the action began to pick up. As promised, we drifted almost half the length of the lake, catching fish as we encountered them. Also as promised, not any real whoppers, but a few that were "above average" and a couple that would turn out to be perfect for a shore lunch of Blackened Pike. Which by the way, was also one of the highlights of the trip. 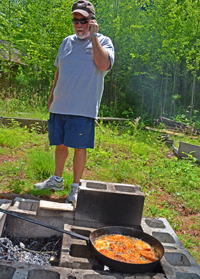 If you've never tried it, I'd suggest clicking here for the super easy Blackened Pike Recipe. To be honest, it was about the best solution to a crummy day that anyone could hope for. The wind, even as strong as it was, had blown from the perfect direction to move the boat along the breakline. Minor adjustments with the MinnKota were all that I needed to keep us on course. The boat speed, even with the Drift Control deployed was a little fast, but for Pike, no drift is too fast. All we had to do was adjust the sinker weight until we reached the bottom. I'd say that the action was about equal whether we used the Whatsits or the Lindy Rig. So, if you like one more than the other, go with your favorite. Simple, but effective, Melinda added another notch on her belt by catching a bunch of Pike, the scrappy fish gave us something to giggle about and I had a chance to show off how good these fish are too eat. In other words, going with the flow, saved the day for me! (8-17) Q) Hi Jeff, "Have you used the Gulp worm in place of a night crawler to keep Perch/Sunfish from stealing the crawler. How much of a night crawler do you put on the 1/16 hook when drifting or trolling. A) Yes, I've tried them a bunch of times. Sometimes the artificials work better than others, but while they do help cut down on bait theft, they don't eliminate it. I am all for experimenting with alternatives, and try do as much as I can, but sometimes, sticking with the tried and proven baits work out best for my fishing customers. I can experiment a lot more on the days when I fish alone, than I can while I'm guiding. Fishing Report August 15, 2012 Jeff Sundin - What a difference a day makes. Monday's cool breeze and crisp Blue skies, gave way to a more summer-like day on Tuesday. Calm, glassy seas and a mostly sunny sky gave fish on Lake Winnibigosh the yawns. With the new rig purring like a kitten again, I was anxious to get out on the big lake and get a healthy dosage of the good fishing everyone has been telling me about lately. Somehow this summer though, I've gotten stuck in a pattern of showing up on the lake on the "In Between Days". I always run into some friends out there and they always tell me about how well they did yesterday. As usual, it was no different this time. As I fished the recently popular, East side of Winnie, it wasn't hard to figure out where the fish have been lately. There was a line of boats fishing all the way down the shoreline from Highbanks into Musky Bay. As we passed by Russel, he said "We killed out here the past few days". Tom said; "It's been really, really good lately" and even the gas station guy said; "You shouldda been here yesterday". Well, I'm sure that later today, I'll be hearing the same stories, but on this day, I won't be out there. I had to temporarily give back the magic widget that made the engine purr last night. So today, I'm going to be limping along a slow speed again. I'll have to find a nice quiet place to fish until Scotty gets me to the planet where we can trade for some new Di-lithium Crystals. Now don't go thinking that Tuesday wasn't a good day on the lake though. It was rewarding in a completely different way. I had a 16 year old boy, who's parent don't fish, haven't fished and aren't going to fish, not ever. But luckily for him, he has a generous aunt who hasn't fished, but wants to learn. Even luckier for the young man is that she was willing to pick up the tab for a "teach me how to catch 'em" day on the water. Starting from scratch, we went through the various working parts of the reels, talked a little bit about the baits and tackle. The we talked about the electronics, trolling motors and finally, actually put some baits into the water. Fishing the weedline with Lindy Spinners and Night Crawlers, we were picking up a ton of small Perch, but like most of the boats out there, we weren't getting any serious Walleye action. A move down the shoreline did help, we got into a mall pod of fish and it looked encouraging, but there was too much traffic in the calm water. In a few minutes, the small school of fish was surrounded, beaten up and done away with. A quick move out to the Bena Bar helped. Sticking with the Crawler Harnesses, we fished the bar in 15 to 17 feet of water and picked up a couple of keepers and a nice, 20 inch "slot fish". There were a handful of keeper size Perch out there too and they kept us busy for a little while. We needed to try at least one more thing, a technique that they could take back to their home water, a lake which contains more Bass than it does Walleye. So we headed for the shallow water and rigged up some YumDingers, wacky style. It was interesting to watch the development as we worked through the initial series of snags and tangles. It wasn't too pretty at first, but eventually we got settled in and managed to boat 8 or 9 nice Bass. Now we were in business! At least according to the youngster, who said that he has no intention of ever eating a fish, no, never, really, not ever! He was completely thrilled with the idea of reeling 'em in and letting 'em go. Now his aunt on the other hand, well that might be something those two will have to work out on their own. 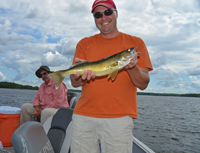 August 15 , 2012 - On Lake Winnie and Cutfoot Sioux - The Walleye action, especially on Big Winnie has been picking up steadily. Anglers are still finding fish in the weeds, but with cooler temperatures and shorter days, Walleyes are rebounding all over the lake. For most of our guests, spinner rigs tipped with Night Crawlers are still producing, but for some, Lindy Rig fishing has become a recipe for success. Straight rigs tipped with an air injected Night Crawler will do the trick nicely. Panfish action has been steady, if you know where to find 'em. Sunfish and Crappie action hasn't been wide spread, but it has been good once you get on them. Northern Pike action has been above average this summer too and anglers who ... Read >> Bowen Lodge Walleye fishing report . 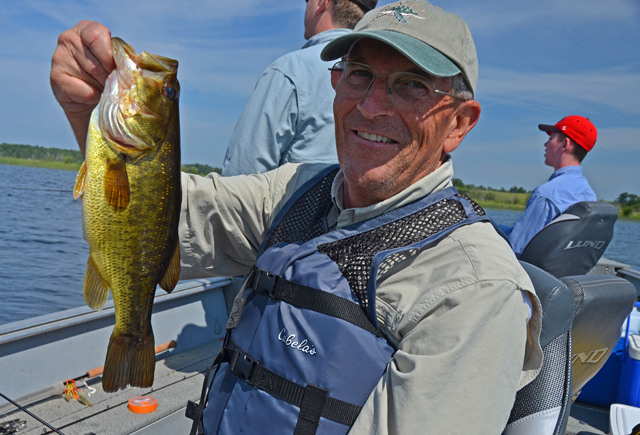 (8/15) Bemidji Lakes Area, Paul A. Nelson, Bemidji Area Lakes Guide Service says; "Lakes in the Bemidji area still have surface water temperatures in the low 70s, so anglers are still using summer fishing patterns for most species on the lakes. Many walleye anglers are using faster presentations including bottom bouncers and spinners, safety pin spinners or bullet sinkers with spinners and live bait, depending on which presentation works best in the depth and type of structure they are fishing. 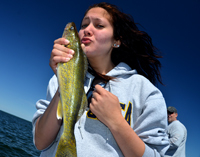 Other walleye anglers are using trolling presentations, with various types of minnow stick baits or other crank baits. Depending on the depth, anglers can use leadcore line or just a thin diameter braid like Northlands Bionic Braid to place the lures in the right depth range. There are also walleye anglers that have made the switch back to jigs and minnows or live bait rigs with leeches, night crawlers or larger minnows. The main reason anglers use spinner rigs is to add speed and flash to a presentation that covers a lot of water. Once anglers locate an active school of walleyes, it is often more efficient to use jigs and minnows or live bait rigs, so anglers can slow down their presentations and concentrate on catching active fish in a specific location. Anglers have been catching walleyes in most of the larger lakes, with fishing improving in most areas as the water temperatures begin to cool. It is too early to tell if there will be more hot weather this summer or if this is the beginning of the fall cool down. 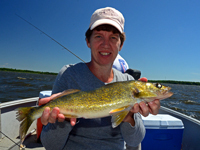 (8/15) On Lake of the Woods, Sportman's Lodges, Jacki LaValla said; " Large numbers of walleyes have been found. 12 miles out Morris Point & Lighthouse Gap using crawlers and and crawler harnesses with gold spinner in 28'-32' of water. Garden Island and areas around Knight Island have been good for controlled depth trolling with crankbaits. in 30'-32' of water. Many 23"+ walleyes found, check out the pictures attached of some nice ones including a real nice 32" Walleye caught by Michelle Becker on one of our charter boats. Evenings are starting to cool, it won't be long and we will be talking fall fishing." - Get your reservations in now, lodging starting at only $39 per person. (8/15) On Lake Winnie and Dixon Lake, Karen wrote; "Jeff, Thanks for putting this all together. I read it offten to try and give my guest a heads up and make it look like I acually get to fish!!! Ha Ha. Any way yes the crappies are on big time on our Dixon Lake. Up in the shallows with a minnow or waxie on. Also the third river of Winnie has seen a few walleye in the back waters, as well as the crappies and sunnies." Yes we have opennings for the last minute vacation with the kids before school starts as well as we now do weekends and have a 10% off mid week special going on. - Thanks much. Dixon Lake Resort. Fishing Report August 14, 2012 Jeff Sundin - Hoping to jump ahead of the typical schedule, we headed for the Crappie hole on Monday, but it was just a little too soon for a visit. Luckily, Walleye fishing picked up the slack and on a picture perfect day in Northern Minnesota, that's not a bad second choice! When we arrived at the lake, I gently launched the new rig into the water for the first time. I took a look around and I was so proud of myself; I'd actually remembered everything! Yes, that's right, I had the net, the poles, the bait, the tackle, all of the life jackets, everything! And then, as it sometimes happens, we discovered one little bug that needed to be worked out. Not too big a deal, in fact a really quick fix, but it still slowed us down just enough to force me into sticking close and small in my fishing choices. So hoping for an early start to the fall Crappie fishing season, I started doing a little prospecting. We tried some shallow spots, some deeper ones, a couple of sunken sticks and along some weed edges. There were some early signs of the approaching change, but except for some really tiny, 5 to 8 inch fish, the Crappies weren't going to be the star attraction on this day. At least not in the areas we were able to travel to. Doing a little head scratching for a second idea, we decided that Walleye fishing would be okay as a backup plan, so we loaded up and headed out. Along the way, I happened into a friend and we talked about fishing conditions, water temperatures and the like. The consensus, we need the water temps to drop into the sixties before we'll see significant changes from the current patterns. Our afternoon went a little better than our morning, it was not fast action at all, but knowing we had to stick fairly close to the landing, we dug in our heels and just kept working slow and steady along the weed edges in 9 to 12 feet of water. Every little point, every inside turn, every heavy patch of weeds, we strained 'em all and picked up fish whenever we could. In the words of my passenger, it was just enough action to keep us interested. Fishing with my tried and true, 1/16 ounce jig and crawler combinations, we kept up the same pace for about 5 hours, fishing until we were down to our last few fragments of Night Crawler. By the end of the afternoon, we'd manage to capture 5 really nice keepers and 4 marginal, but still keep able and completely delicious fish. No, we didn't set any records, but for Ol' Limpy, it was a darn good example of working within my limitations. Later in the evening, I made a quick parts swap, ran back out to the lake for a test run and got the rig running like a champ. With luck, we'll get that little bug worked out permanently and I can get back to seriously working on training the new rig! (8/14) On The Iron Range, From Greg Clusiau " Had a "going to plan B" moment himself recently, he said; "It would be another hour north but it was only 9:30 am when that decision was made. We had made “day trips” there before and this would be no different, especially since Blake was doing all of the driving. Once there, we realized that another ... >> Read Greg's Full Report . Angling News 8-14-12 Chad Schilling earns coveted FLW Walleye Angler of the Year title - Competing at the final National Guard FLW Walleye Tour at Escanaba, Mich., on Lake Michigan. Before the field was culled to the top 10 on the final day, the LUND Boats and Mercury Marine pro Chad Schilling – who had just made the cut – realized, mathematically, he had already earned Angler of the Year. Along with the Angler of the Year trophy, the Akaska, S.D., resident received $10,000 from FLW and another $10,000 from LUND Boat contingency dollars. He also receives an automatic berth in the 2013 National Guard FLW Walleye Tour Championship. Fishing Report August 13, 2012 Jeff Sundin - Made it home last evening from Crookston just in time to fill the new rig up with rods, tackle and assorted burried stuff that I thought I'd lost. We're heading for points unknown this morning, but after the reports I've been hearing lately, it wouldn't surprise me to wind up on Winnie. (8/13) Gus Sheker, Gus' Place Resort on Ball Club Lake; "Last week was the first opportunity my wife was able to get away from work at the resort to get out on the lake for a few hours of fishing, it was my second time out this summer. My wife Susan usually wants to fish Northerns when we go out together and so that is how we rigged our poles; a gold spinner, a sucker minnow, 3/8th oz. slip sinker and a stinger hook trolled or drifted in 12 feet of water, at a speed of about one MPH. This is my second year using the MinnKota ipilot. 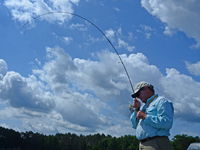 I have two prerecorded tracks that I use specifically for fishing Northerns. This new ipilot technology allows me hands free driving and plenty of time to enjoy fishing. I headed out to one of my favorite spots up along the North shore, it was another bright, sunny, hot day around 86 degrees. It didn't take long to hook up the first really nice, fat 4 pound Northern. During the day there were 8 or 9 others caught, most of them released, but we kept two for the dinner that evening. One of the most interesting observations of the day was the great amount of large dead White Fish floating on the surface, many of them around 24 inches long, or so. There must have been a couple dozen spotted through out the course of the day. I went over to a few of them to see that they were fresh dead, no signs of disease, wounds or obvious reasons for their death. That day the surface water temperature was 78.9 degrees and it has been that warm many days in a row. In the 11 years I have been at our resort I have never seen the lake remain so warm for so long. I wonder if our hot summer is the cause for the death of so many of these deep cold water fish? " - Gus Sheker. Gus' Place Resort . (8/13) Hey! This week my buddy Jonny Petrowske got to go Bass Fishing! That lucky dog teamed up with Jon Thelen on this week's video "Froggin' for Largie". Jon and Jonny caught Largemouth Bass on buzzbaits and hollow body frogs in the summer heat. They've got all the information you'll need for a great head start this weekend. Learn when and where to throw a frog or buzzbait as the conditions of the day change. You may be surprised at how effective these topwater tactics can be throughout the day. Click to view >> "Froggin' for Largie" . (8/13) To help expand on Gus' point about the summer kill of Whitefish on Ball Club Lake; Extended periods of hot, calm weather cause some lakes to form a thermocline. It's a barrier that occurs when warm surface water refuses to mix with the cooler water further below. In our region, it's common for this thermocline to form somewhere in the mid twenty foot neighborhood. Fish that prefer cool water typically living deeper than this barrier, will eventually consume most of the Oxygen in their preferred zone and be forced into shallower water where they can get enough Oxygen. The problem now is that the warmer water speeds up their metabolism too much and eventually burns them out causing them to die. There can be multiple levels of summer stress on fish and there are a variety of fish species that could be affected by it. Tulibees, Whitefish, Suckers and Northern Pike all come to mind, but there are others too. Stong winds or heavy rains will provide temporary relief during the summer, but the final soulution occurs closer to fall, when cooler weather forces the surface temperature lower than the temperature at the thermocline. That's the event that's referred to as the fall turnover. Put simply, the surface water gets cold and drops toward the bottom and the lake water literally "turns over". 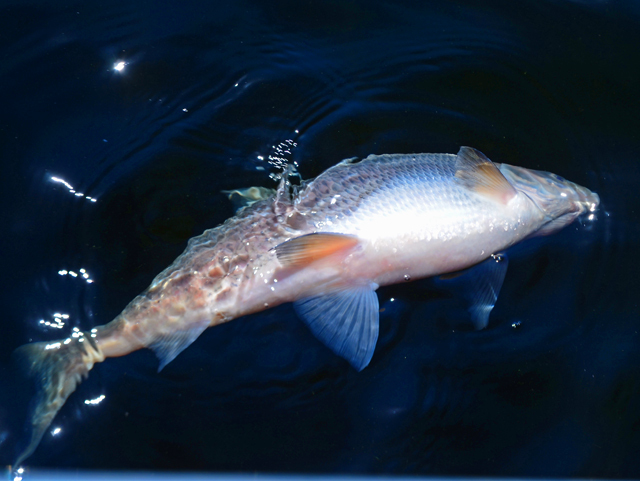 That re-Oxygenates the lake and cool water fish are free to return to their deeper, cooler water haunts. Fishing Report August 12, 2012 Jeff Sundin - On Saturday, I juggled my schedule around to get a day free to rig up my new boat. Someone called it a day off, hmmm..... maybe I missed something. My day began bright and early at the hardware store, where somehow I managed to remember all of the stuff I'd need. Then, picked up the boat, got her home, found a parking spot and hunkered down. Thirteen hours later, I poked my sunburned head up over the transom and looked at the installation checklist; Wave Wackers? check. Humminbird? check. MinnKota? check. Battery charger? check. Minnow aerator? check? Seats, coolers, tie downs, straps and prop? check. "Hey, guess what? It's all done, rigged and ready to hit the water!" This is my 8th Alaskan and I can hardly wait to start getting it trained in. The old one is going to a good home, but I learned a lot in that boat and I'm sure gonna miss it. Fishing Report August 11, 2012 Jeff Sundin - On Friday, Walleye fishing wasn't fast, but it was steady, and for a calm, sunny day, I'd call it pretty good. Usually after a cold front passes through, the crisp blue day that follows presents a challenge. On this post cold front day, I'd say that it did. Fishing, especially in the morning gave us few highlights and wasn't stacking up to be a very action packed day. Luckily for us, as the day went on, it became easier to find fish and easier to coax them into biting too. We arrived at the lake to an air temperature of 55 degrees, I think about the coolest morning we've had in well over a month. The surface temperature of the water had fallen from 76 degrees down to 72-1/2 degrees and there was only the slightest ripple to break up the surface. Rewind ........... On Friday, I was hoping to discover that I had a crew that wanted to go Bass fishing. When presented with the question, they answered; "No, we have those in our lake". How about Crappies? "No we have 'em in our lake". Northern Pike? "No, we want Walleyes". Walleye or die? "Yes, Walleye or die!". Oh, okay, well this could be a little interesting, but here's goes. Fast forward ...... We headed out and started checking the weedlines in water depths of 10 to 14 feet. There were some signs of life and Joy caught a nice Walleye within the first half hour. But soon, the signs of life would begin to disappear and except for a few small fish, a handful of Pike and one Giant Bluegill, it was beginning to look like a bust. In fact, I was heading for the landing to switch lakes, when I decided to make one last stop. Heading toward the kind of terrain where you'd never expect to bag a Walleye, I'm sure that my crew thought I was heading for a Sunfish hole. Lilly Pads, heavy weeds and sunken logs inhabited the bay. The last place most of us would search for Walleyes. It doesn't always work out, but this time, it was a good hunch. There weren't a million fish, but there were some Walleyes hunkered into a shallow, weed choked shoreline. The Mixed Coontail, Eel grass and Northern Milfoil made it a little tricky to work our baits without snagging, but luckily for me, fishing the weeds came naturally to these two experienced anglers. Also lucky, our presentation, small jig heads tipped with Night Crawlers was still getting attention from our fish. Trying to work most other presentations through the heavy cover would be really tricky, not impossible, just tricky. What worked for us, was to move slowly, .5 to .7 MPH along the visible edge of the weeds as we pitched the jigs into the pockets along the outer weed edges. If I let the boat wander too far away from the cover, the action stopped. Likewise, if I allowed us to get buried in the weeds, we'd be out of luck too. The fish were occupying those small gaps between heavier weed patches. If we'd had some clouds or a heavy breeze, I think those fish would have moved to the outer edges, making it a little easier to present alternative baits. But as long as we knew where they were, we were able to grind away all afternoon, picking them up one by one. Well, I said that I wanted to go Bass fishing, so we did. Walleye fishing, Bass style! Fishing Report August 10, 2012 Jeff Sundin - Cooler weather is forcing water temperatures down in a hurry. Just a week ago, we were looking at temps in the high seventies, even the low eighties in selected spots. Today, we're tickling the lower end of the sevety degree range and with the drop in temperatures, fishing action is poised to pick up. That is, after an adjustment period. That's going to be the focus of the report as we head into the weekend. Fishing along with a couple of really special projects are going to interrupt me for today, but don't worry, news about how the fish are reacting to the cooler weather is just around the corner! Oh and by the way, there are more Q& A sessions on the way too! Fishing Report August 9, 2012 Jeff Sundin - You might remember this comment from my fishing report this past Sunday; (8-5-12) There is a "hot bite" panfish scenario playing out on a lot of lakes in the Grand Rapids area, so if you've got a couple of kids who need a proper introduction into fishing. Jumping on the chance to do it now is a great idea. The weather forecasts are for a downward trend in temperatures and as the water cools, this hot panfish bite is going to simmer down. In other words, it's at its peak right now and if you snooze .......". Well just to illustrate the point about short windows of opportunity, yesterday, only 3 days later, I returned to the same lake and fished the same spots. This time, Sunfish that had been sitting at the edge of their seats, waiting for a chance to take our baits, were now bored and semmingly uninterested in most of our offerings. When we arrived at the lake, the surface temperature was 74 degress, plenty warm, but still down 3 degrees from our last visit. The sky was cloudy and there were light sprinkles of rain, barely noticable on the lakes surface. To me, it looked perfect and I was getting set to tell you all about the gigantic hall of panfish. Except for one small thing; There weren't any massive schools of Sunfish arguing over our baits. Don't get me wrong, it wasn't a disaster, we still caught enough fish a great fish fry at lunch time and we couldn't have asked for better weather. But in that short, three day span of time, the whole system had shifted gears. There were two changes during that time and both of them probably contributed to the cange in attitude. The drop in temperature was probably only a secondary factor. The real culprit, I think was an insect hatch that was occurring on the lake. I'm not even sure what they were, but very small, Fruit-Fly looking critters were covering the calm surface of the lake. There were schools of small Sunfish and Bass feeding on these bugs. In fact, the surface of the lake over every weed bed was alive with fish dimpling at the insects. Using live bait to capture the Sunfish was a waste of time, we could get them to pick at worms and leeches, but mostly, we were just feeding fish, it was rare to actually get the hook set. Our best results came by putting a small, 4 inch Black Yum Dinger on a 1/16 Lindy Jig. The jig head color didn't seem to matter as long as the worm was black. Using the tiny jig-worm rigs, we were able to trick enough of the larger size fish to gather a cooler ful for the fish fry. After lunch, we decided to take a gamble and head for a new lake. None of us had been there before so it promised to be an adventure. Win or lose, a new experience. I'll have a few words about that experience too, but for now, I'm up against the clock and I promise to catch up on that story in the morning. For today, deep water Lindy Rigging is calling my name. I might have to wander around a little, but with luck, I'll stumble into something interesting. (8/9) Zach Dagel, Grand Rapids Guide Service. 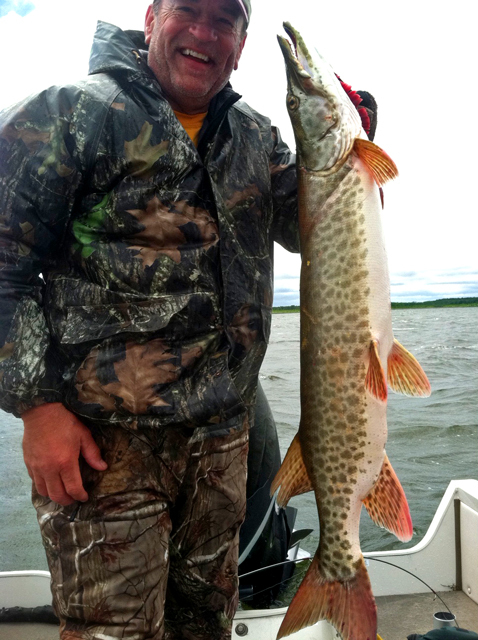 A quick note from my buddy Grant Procop about Musky fishing on Leech Lake. Click and Read Report . (8/9) On Lake Winnibigoshish and Cutfoot Sioux, Bryan Harris, Eagle Nest Lodge wrote; "Walleye fishing got tougher this week on Cutfoot Sioux. But nice northerns and perch are active. Weed beds are holding lots of fish. A few panfish are coming out of Little Cutfoot, too. The August change is on, and we are looking forward to an excellent fall fishing season. We do have openings throughout the end of August to October." OH! By the way, Bryan offered a special for you too; If you're making a new reservation at Eagle Nest for this late summer/fall season, just mention seeing this offer, in this report and receive free dockage for your boat. The offer is good for any time, now through the MEA weekend. It's a value of $15/night or $60/week! (8/9) Grand Rapids Area Fishing Guide, Jason Green Checked in and says; "Fishing continues to be excellent in the Grand Rapids Area. Pan Fish are at a peak right now and are extremely aggressive. Currently they can be found in shoreline vegetation. Walleye Fishing continues to be above average for this click and Read Report . (8/9) On Lake of the Woods, Sportman's Lodges, Jacki LaValla said; "Fishing has been great! One of our veteran guides said it best yesterday, "The fish bit so good today, you wouldn't have wanted to go swimming." Bait fishing using spinners/sinkers and a minnow and controlled depth fishing trolling using crank baits have been working well. Controlled depth fishing has been out doing bait fishing 2-1 however. Reefs and mud have been hot spots in 30'-34' of water. The best schools of walleyes are deep this time of year. The AIM Pro Tournament will be in town next weekend, Aug 16-18. The Pros will be in town along with lots of events and entertainment going on." 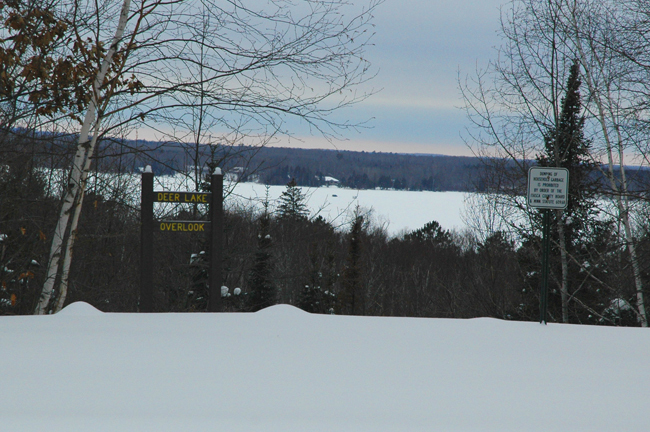 Click to learn more about the Lake Of The Woods, AIM Tournament . 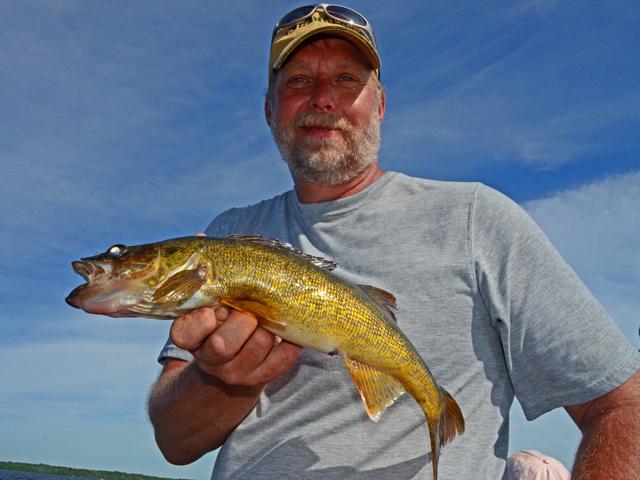 (8/9) On Bowstring Lake, Bowstring Shores Resort, Darv Oelke says; "Walleyes are slowing up. Still some are in 10 to 12 feet on raps. Perch color or blue and white.Crappies are biteing great down on the rock pile. Nice 10 to 14 inch. Perch are also good in the 6 to 8 feet. crappies are 4 to 6 foot range." (8/9) A question about electronics and getting them "fine tuned" came in yesterday. A) Depending on the unit you have installed in your rig, there may be a number of ways that you can deal with the heavy "clutter" that you mention. But first, let's address the shape of the arches. In order for any sonar unit to give you that nice, cresent moon shape arch, it assumes that the boat will pass over the fish in a straight line. Think about this picture, the one that you'd see as my Humminbird prints a nice size Walleye; First appearing on the screen, the head, then the heftier mid-section and finally the slim tail. Since the head and tail are slightly lower than the top (back) of the fish, the display shows the classic arch. Now, let's think about real fishing; The display is going to print the sonar returns in any order that the unit receives them. Sometimes we're drifting, sometimes trolling, sometimes at anchor. We come at the fish from all sorts of angles and we find them in a wide variety of depths. If we pass over the fish as we drift in shallow water, it's possible that we'll see them as a blob, maybe a lump on the bottom or possibly an arch. If you're at anchor and the fish sits stationary below the boat, your unit will print this a continuous line, until either the boat or the fish moves. In deeper water, you're viewing a wider section of the water column and you'll notice that fish tend to be much easier to distinguish. But here too, your boat speed and direction will influence the shape of the fish as they print on your screen. While it's not really practical to expect every fish to show up as that classic arch, more often than not, in deeper water, they will. About the clutter; I do not run my 998 on automatic I customize the settings so that I can achieve a balance of seeing what I need to see, without seeing too much. Most of us have a range of depths where we typically spend most of our time fishing. For me, there are really only two main scenarios; Shallow water, let's say 5 to 15 feet and mid-depth water, 15 to 30 feet. What I do is to first head for some territory where I know that there's a sandy bottom content. Knowing that rocks will give me a stronger return and that mud will return a weaker signal, I set my sensitivity to the level that gives me a good return on the sand, without a ton of clutter. Naturally, it varies with the depth, but Humminbird's menu system is very easy to learn and tweaking the settings while I'm fishing is no problem. During early morning or late evening, there are times when all of the aquatic life in a lake becomes active. There are moments when it's almost impossible to see through it all and when that happens, I'll switch into what Humminbird calls "clear mode". This filters out a lot of the plankton and tiny fish, forcing the unit to only show stronger signal returns. I know that this is a really short, basic answer. I'll happily expand on any part of it, just go ahead and pin me down for further explanation. (8/9) While I was reading about Lake of the Woods, Vern added a question about landing nets. A) Vern, It's really a cooincidence that you asked, because I finally took care of my own net problem this week. The one that got stolen out of my boat last year, was a Beckman PT-2218-6 with a 6 foot handle. After waiting most of the summer, limping along with an old one, I finally caught a free moment on Sunday and headed over to L & M Supply in Grand Rapids and replaced it. They only had one with a 4 foot handle, the PT-2218-4 it's got the good heavy treated mesh basket and I think the 4 footer is going to work out fine for this boat. I just put it into opeartion yesterday and now I'm like a new man! If you try one, I promise that you will love it! Here's a link to the Beckman Penn Series Nets . (8/9) Bemidji Lakes Area, Paul A. Nelson, Bemidji Area Lakes Guide Service says; "A couple of cool nights were enough to drop surface water temperatures in the Bemidji area from the upper 70s down to the mid 70 degree range. The cool overnight temperatures also knocked down some of the algae, with visibility in most lakes increasing by half a foot or more. The bite for most species has been spread out during the day, with smaller groups of fish becoming active at all times of day. It has not been a real hot bite for any species, with bass the possible exception because they are better suited for hot water temperatures than most species. Walleye anglers are catching fish on most of the larger lakes, but it has been a slow grind rather than fast and furious, with anglers having to hit multiple spots and work hard for the fish they catch. The full moon this past week also made the day bite slower for many species, with some fish taking advantage of the moonlight to feed after dark. It is too early to tell which way the weather is going to go, with another warm-up likely before the gradual fall cool down begins, which usually happens towards the end of August. Anglers fishing for all species should benefit from the slight increase in visibility in the water, with the fish able to see their baits from a greater distance. Most species have been feeding heavily, with many fish having full stomachs when they hit the fish cleaning tables." - Paul A. Nelson, Bemidji Area Lakes Guide Service, panelson@paulbunyan.net 218.759.2235 . (8/9) From Wired2Fish; "We covered so much of ICAST, so fast that a lot of folks have asked us for links to articles they might have missed. Here are several of the companies we covered at ICAST. Just click on any of the links below to be taken directly to the new product coverage from each. They are in a no particular order as of yet and we still have a few more to add to the list so we'll pin this to the top of our What's Up section so you can find it if interested". Click here to view and enter . 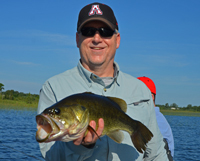 Fishing Report August 8, 2012 Jeff Sundin - Just when everything was pointing toward the "Dog Days" of summer, fall begins whispering a few hints in our ears. Cooler nights, bright, dry days and the feeling that there's a "pre-fall" pick up in the fishing action, just around the corner. Yes, fall is coming, it's just around the corner and it's time to start looking for the treats that come along with it. For me, Panfish action has come to the forefront and as fall approaches, Crappies will soon become a part of my daily life. Oh yeah, we're fishing for Walleyes too, but on some days, they're gonna have to take the back seat. Take today for example; Remember the story from a few days ago? About how we were trying to catch Walleye, but the Sunfish would not leave us alone? Well guess what we're gonna do today? Ha! All I need to find is a good place to cook lunch and I'll have it made. Don't worry, you'll get the full report tomorrow. 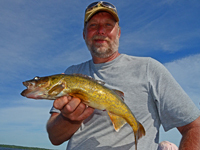 Fishing Report August 7, 2012 Jeff Sundin - Walleye fishing was an up hill battle on Monday, but why? It was one of those days where figuring out what to do next just wasn't coming easy for me. Fishing familiar water and using time proven techniques was working fine, for me. But somehow, I couldn't seem to transfer the knowledge to a crew that was fairly new to Walleye fishing. Working toward a goal of gathering enough fish for a shore lunch, we fished the shallow weed and rock patterns that have been producing reliably for the past month. The action wasn't fast at all, but we were getting enough bites to get the job done, if we could just figure out how to make them count. I can remember getting a little frustrated as I repeated; "Get the bite, feed the line, take up the slack and WHAM!" ........ Reel in another empty hook with the last half inch of Night Crawler still pinned to the hook. Hmmm..... Okay, let's try again ... Get the bite, feed the line ... We tried and tried, but it just wasn't coming together. It wasn't a complete disaster, not at all, in fact by lunch time we had plenty for the fish fry and even a small surplus to send back home. The problem was that I had caught the lions share of the fish, and there was no sign of a sudden surge in the action. That would have helped the crew reach the tipping point, you know, where the light bulb finally goes off and it dawns on you that you've figured the system out. At lunch time, I thought maybe I could make life a little simpler. Knowing that there had been a fairly good Walleye bite going on another lake, I decided to pack up, leave this lake, cook lunch and then head for lake number two. Oh oh, that's where I stumbled into Murphy. You know Murphy, right? And I'll bet that you know some of the corollaries to Murphy's Law? This time it was the corollary; "Nothing is ever so bad that it can't be made worse by over- thinking"
When we arrived at the next lake, the Walleye bites were even fewer and farther between than before. In fact, no one was even getting a chance to practice anything, it just wasn't happening. After trying a few spots, fighting a stiff wind and looking at each other with that, "what are ya gonna do now" look, I was just about to pack up and leave when Roger caught a small, but welcome Walleye. That catch sort of turned the focus back toward us digging' in our heels. We did manage to catch a few fish, but I'll always wish that I would have just stuck it out on lake number one. Instead, this time I just did a little too much thinking, I played right into Murphy's hand. We stuck it out, hoping for an improvement, staying until sunset, but the event that usually saves my tail feathers, "the evening bite" never happened either. Some days go like that, I don't like it, but it happens and when it does, we always seem to learn just a little bit more. Next time, I'll just remember to do a little less thinking. Sorry Murphy, but you're not gonna win 'em all! Oh and by the way, to Roger, Curt and Noah; Thank you too, for hanging in there on a tough day! Remember the highlights, forget the disasters and next time, we'll pick up where we left off. Odds are we'll come out on top! (8/7) On The Minnesota Tournament Trail, Zach Dagel, Grand Rapids Guide Service; Walleyes on Lake Winnibigoshish were cooperative this weekend, reports from other anglers on the big lake were good too, especially on Saturday when there was a good wind. The bite and the location changed on Sunday and they found the Walleyes at ..... click here >> Read Complete Grand Rapids Report . 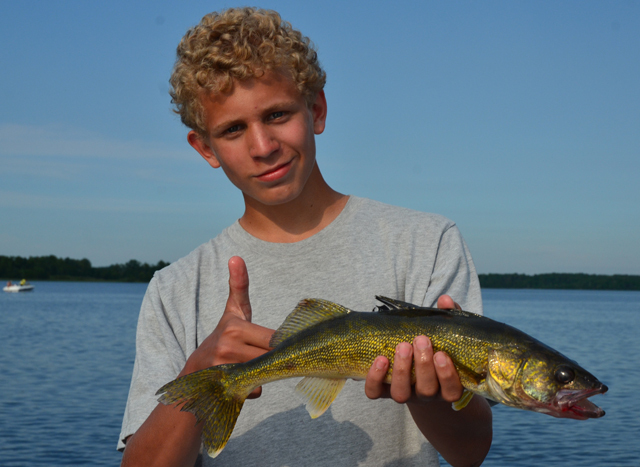 (8/6) Finding Walleyes in deep water, was Jon Thelen's mission for this week. He found 'em and then used Leadcore Line to put his crankbaits at the correct depth. You've been interested in deep trolling for a while, and this video is a great jump start to get you into the groove. Watch as Jon Thelen demonstrates how to use leadcore line to keep a crankbait like a Smithwick Rogue or Lindy River Rocker in the strike zone. >>> Click here for Leadcore Trolling for Deep Walleye . 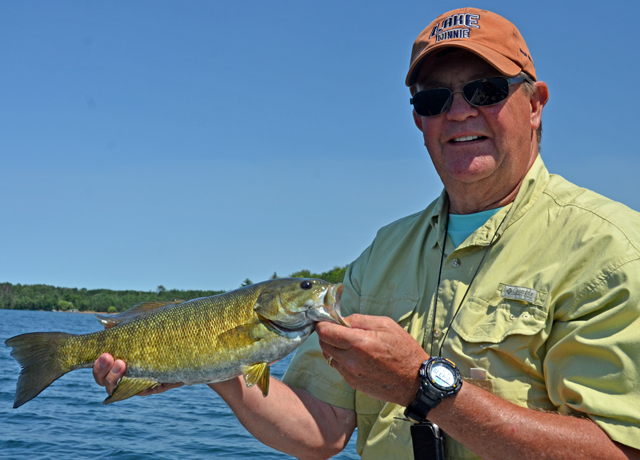 (8/6) On Lake of the Woods, Border View Lodge, Mike Kinsella wrote; "Anglers are still catching lots of big fish in the deeper waters of Big Traverse Bay. While still bringing in limits, many are throwing back more fish than they are keeping. Drifting or trolling with a spinner and a leech or crawler is working very well. Gold, chartreuse, and orange have been the colors of choice. Highs for the upcoming week are comfortable mid 70s with lows dipping into the 50s. There is a chance for showers bet there promises to be plenty of sunshine. 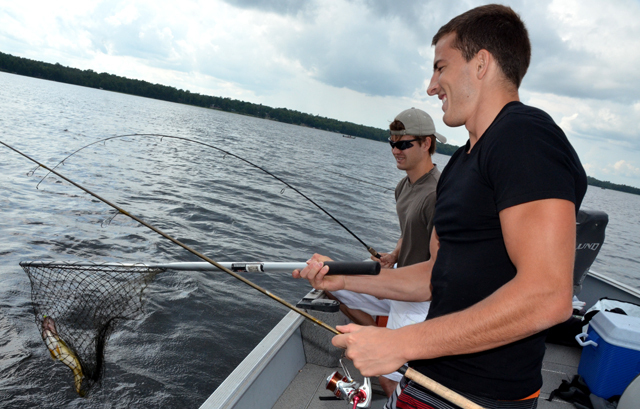 Summer is winding down, but there is still time to get that fishing trip in before school starts. Make your plans now!" . (8/6) An interesting question from a reader that crops up once in a while. I've answered this one before, but it's worth repeating. A) I must be doing something almost right, because I get an equal number of emails from anglers who are upset, thinking that I gave up too much information, as I do from anglers thinking that I don't talk enough. Sometimes I mention the lake, but sometimes I don't. If it's Winnibigoshish, Leech or Cass, I will typically say so. Even some of the smaller lakes get mentioned from time to time, especially if the name of the lake is important to the story I'm trying to tell. But if it's a lake that can't withstand a ton of pressure, or if it's a lake that has similar characteristics to a group of other, similar lakes, then the information would apply to all of them, and naming names becomes un-important. Always try to remember, the purpose of the report is to help give you ideas about what to try and when to try it. It's to give you some tips on which rigs might be working best, water temperatures and seasonal trends that affect fish location. I've learned from long, frustrating days on the water that trying to chase someone else's "Hot Bite" is nearly impossible. Trying to do that would just be a complete waste of your time. That kind of information just doesn't have long enough shelf life. Your best bet, is to learn as much as you can from reading about our experiences and then combine that information with your own, to for a solid fishing plan for yourself. I really respect the anglers who do some of their own thinking and add the information together with some of their own ideas and discvories. They almost always figure out a way to succeed and they are almost always the ones having the most fun! That's what fishing is supposed to be, right? (8/6) On The Iron Range, From Greg Clusiau "... (Tom) had been out the day before and fishing was superior, with walleye after walleye making their way into the boat, along with a few big ones. This day, however, was another Big Winnie in the making, as the fish had shut down a tad and strong winds hampered boat control. With a little scouting around, we found them 5’ deeper than they were on Saturday. It turned out to be a good “eater” fish bite with several walleyes in the 14-17” range being caught. Tom used jigs and minnows, while I put on a clinic using a jig and ... >> Read Greg's Full Report . Fishing Report August 5, 2012 Jeff Sundin - Talk about your basic day of easy action fishing, wowee! Saturday might not have been the ideal day for a big time "Walleye Purist", but if putting smiles on your kids faces was the goal, well then it was easy work! Fishing with long time friend and customer Bill Linder, I knew ahead of time that it wasn't going to be a typical fishing trip. First we'd fish with a couple of his grand kids, then we'd drop them off and trade places with someone else, and then we'd be done early, in time for Bill to go home and do some more entertaining. It was a lot easier to just stay right there on Bill's home lake, than it would be to go and try to find the hot Walleye bite and waste all of our time driving in the truck. The lake, a really gorgeous smaller lake has clear water, lots of good weedlines and a mix of Panfish, Bass, Walleye and Pike. If the fish would cooperate, the lake would be perfect for this kind of fishing trip. When I arrived at the lake, skies were Grey, threatening rain and there was a fairly strong wind. So the clear water was definitely not going to cause any trouble at all. Surface temperatures ranged from 75 to 76 degrees, plenty warm enough to keep the Bass and Sunfish active, but not too warm for the Walleyes, if we could find them. The breeze was perfect for drifting at our first stop, a long stretch of weedline near the Government Point. It's a spot I always check because it's where the best cooking spot on the lake is located. Too bad though, today it was occupied by a camper like it almost always is, so If we got hungry, we'd just have to wait. At first, I set up all four rods with jigs and Night Crawlers and we started into our first drift. I don't know if I've ever seen the Sunfish in a more voracious mood! We couldn't go 8 inches without a Sunfish snapping up our worms. There were some Bass on the weedline too and Bill's Granddaughter even bagged a nice keeper size Walleye, but at the rate we were going, we'd be out of bait in a couple of hours. We started experimenting with plastics, minnows, leeches whatever we could think of to try and narrow down our presentation so that the larger Bass and Walleyes could get a chance at our lures. We were mixing and matching so fast that I sort of forgot who caught what on which lures, but the upshot was that we caught some of the nicer size Bass using a small, 4 inch YumDinger rigged on a 1/16 ounce jig head. In fact, Bradon bagged a really nice, 4 pound plus Largemouth using this bait. In spite of catching the first Walleye on a night crawler, there was no way that we were ever gonna get another one that way. The small Bass and Panfish were never going to leave the worms alone, not at any spot and not at any time. 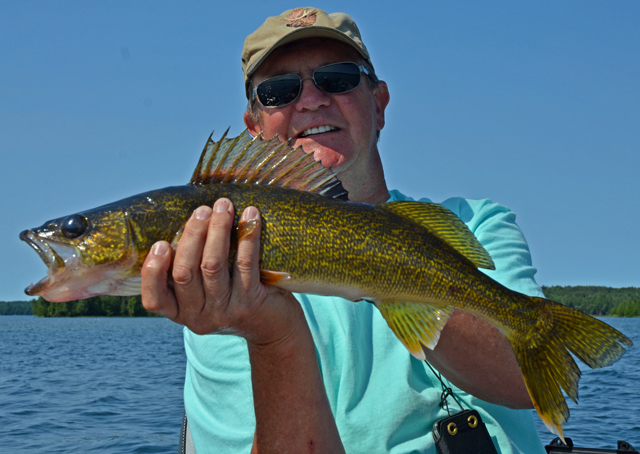 It was Bill who stuck with the jig and minnow until it finally worked on a Walleye. He caught Rock Bass and some Largemouth too, but every once in a while, he'd pop another eater and by days end, the jig and minnow presentation accounted for a half dozen perfect 15 to 16 inch Walleyes. Not exactly a Walleye bonanza, but for this kind of a multi-species action trip, it's really not bad either. The territory that all of the fish were using was identical; Weed line edges in 16 to 22 feet of water. Points were slightly better than straight stretches of weedline, but it was really the weeds that accounted for almost every fish we caught all day long. There was plenty of wind for drifting, in fact too much at times, so that was our main presentation. I'd get the boat set up for a drift, drop in the drift control and work the weed edges a couple of times before moving on to the next one. (8/4) In Grand Rapids, Zach Dagel, Grand Rapids Guide Service; Zach Dagel has been doing a little exploring in the Grand Rapids area and he has made some intersting discoveries! 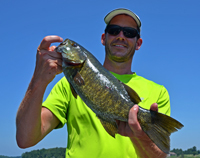 Warm water has the Bluegill action churning, Smallmouth Bass are stacked up in some interesting places and the Walleyes are ..... click here >> Read Complete Grand Rapids Report . Fishing Report August 3, 2012 Jeff Sundin - Thursday was almost picture perfect in Northern Minnesota. A cooler breeze, Blue skies and puffy White clouds were the backdrop for a day of reasonably good fishing. When I met the two young men that I'd be fishing with, the goal was Walleye and a shore lunch, so breaking out into new territory didn't really wind up on the radar screen. We headed back to the safety of familiar waters and familiar patterns. Most of our experience was similar to recent fishing trips except that there was a noticable shift deeper in the Walleye location, especially during the calmer periods. Cooler temperatures and a fresh breeze may have been just enough to give the fish a little re-charge of Oxygen and allowed them to return to a few of the deeper structures. Unlike recent trips where fish have been almost exclusively holding in the shallow 8 to 10 foot range, fish that we caught today were holding anywhere from 10 to 20 feet. 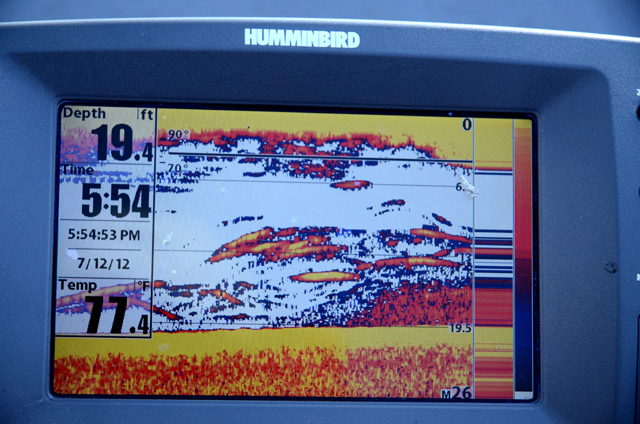 There were some fish even deeper, in fact the Humminbird revealed fish as deep as 24 feet, but we can't claim that they were Walleye, because we didn't get those fish to bite. 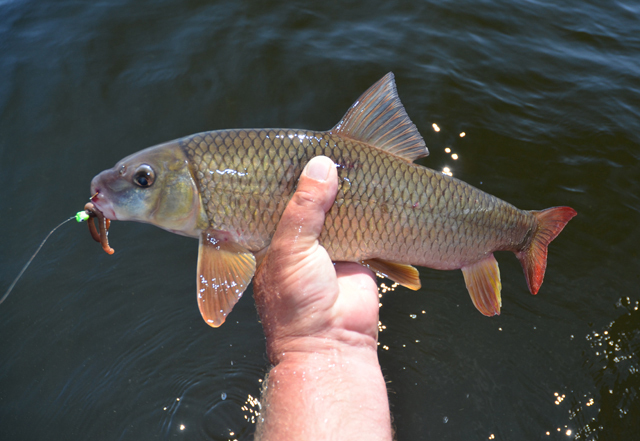 This summer, we've caught a lot of Redhorse Suckers, in fact one or two on almost every trip including Thursday, where we caught two and lost a couple more. So when I see fish located deeper, especially on mid lake humps or bars, I always have this thought in the back of my mind; "If the fish don't bite quickly, then don't waste a lot of time on them", they might not be what you're after. We stuck with the Night Crawlers again, because they just keep on working, but I already know that there will be change in the air soon and the reliability of that presentation will not last forever. As I continue to see these fish build up on deeper structures, we'll be shifting our focus toward Lindy Rigging using all forms of live bait. I'm keeping my eye on some late some spots where rigging with Redtails and Creek Chubbs will become really important, probably soon! Fishing Report August 4, 2012 Jeff Sundin - On Friday I said; "Today, I am fishing with the world record holder for optimism! In fact, if I learned mine from anyone, it's my Guru of Optimism, Warren Snyder. Today I've got Mr. Optimism (Warren) , Mr. Optimsm Junior (Nils) and seven year old, little-little Mr. Optimism (Bjorn). With all of them in the same boat at the same time, how can I go wrong?" Well the answer is, you can't! Even with a rainy start, a sluggish Walleye bite and lots of stuff to get stuck on. We still manage somehow to come out looking good at the end of the day. My only regret? Between the rain, the waves, the tangles and the fish, I didn't take out my camera and snap some pictures. There just never seemed to be enough time and now, after it's all over, I look back and remember some of the times that should have been captured. Next time, we'll do that a lot more! This wasn't the kind of fishing trip that gets real technical, so if you want to see what we were trying to do, just read the reports from the past couple of days. This is the kind of trip where I just let things go how they go and then wait for the"Snyder Effect" to kick in. The Snyder effect is kind of hard to explain, but to put it simply; No matter what I think is gonna go wrong and no matter what disaster I think may be looming, I just have to put that out of my mind and wait for everything to work out fine. And it does! And it did! And it will again next time too! So there then, that's all and Thank You! For today, Another family style fishing trip on a really special lake, 3 in the morning, 3 in the afternoon and whatever bites first is what we'll be fishing for so there's no telling what we'll be up to! But tomorrow, you'll know. Fishing Report August 2, 2012 Jeff Sundin - Wednesday was my day to go back to Walleye fishing and luckily, they were on the cooperative side. That, along with a much appreciated cool down in the temperature made for a pretty nice day on the lake. When we started our trip on Wednesday, it looked like maybe my Walleye fishing had hit a little road block. A couple of encouraging early catches, were followed by a string of smaller than keeper size fish and even a couple of empty holes. Somehow though, the fish were just in a temporary funk and there was a nice recovery in store for us. At the landing, the water temperature was 76 degrees and like most of the area's Tulibee lakes, there was some evidence of a slight summer kill. We spotted a dozen or so of the silvery fish, most of them fresh, floating on the surface as we made our way toward the Walleye hole. The forecast had been for strong winds, but at the beginning of our trip, winds were light, in fact you could say calm. Like most Walleye anglers, I've been focusing my efforts on shallow water weeds, rocks or gravel and today was no exception. We started at a main lake bar that topped off at 10 feet, it has rocks on top, but is surrounded by a grass line. Usually, the fish have been on top, between the grass and rock, but on Wednesday, they chose to locate deeper, on the outer edges of the grass and some even deeper, down into the 17 to 18 foot range. The problem was that many of the fish we marked in the deeper water, chose not to strike as we drifted through. There were some chances that we missed, but except for a couple of keepers and a handful of tiny fish, it was looking like we might be finding a new lake for the afternoon session. A series of stops on other likely spots yielded similar results, small fish, Perch and lots of snags. By 11:30 AM, we were close to having enough fish for lunch, but still scrounging. By now though, the wind was picking up and I thought that maybe one more visit to "The Cookie Hole" could help put us over the top for the fish fry. This time, the fish were higher on the structure, located in about 12 feet of water and this time, they were more aggressive. 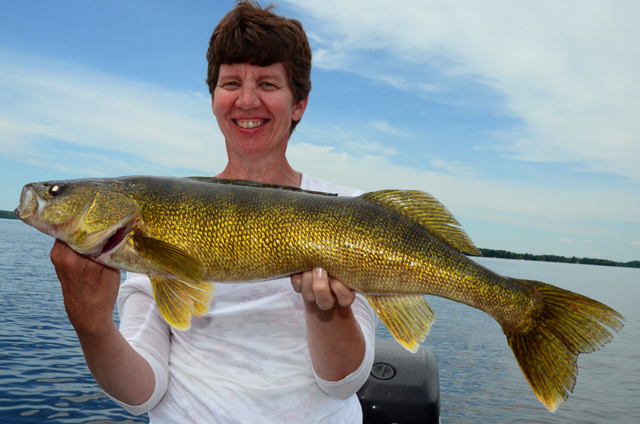 On the first drift, we picked up three fish including Laurie's fat and healthy 26 inch Walleye. Not bad for someone who never used a spinning reel before! Anyway, the turnaround was welcome, so was the shore lunch and so was the afternoon fishing. Our 1/16 ounce jigs tipped with Night Crawlers gave us one more session of decent fishing and by days end, I was able to send them home with full tummies and some nice keepers for Grandma. So that's worth a smile, don't ya think? (8/2) Gus Sheker, Gus' Place Resort on Ball Club Lake; The Fishing Report on Ball Club hasn't changed too much for the past several weeks. Gus says that right now, they're enjoying great fishing fo Northern Pike and he added; ... and they're not skinny". Many customers a having very good fishing for nice Perch too and they can sort out fish 10" and over.
. - By the way, did you ever wonder who wins the Wired2Fish contests? Click here for a full list of Contest Winners . (8/2) In the Bowstring Lake Area Otters Guide Service, Robby Ott Says; "Things for me have been real sporatic. We have been putting on alot of miles in search of the right species of fish. For the most part, I have been keying on the thickest weeds I can find. The thicker the better, the kind that even a snake would hesitate to enter. Northlands Weed Weasel has been my go to jig, after finding them with my search bait, a gold, silver or pink spinner. Tipping these with what ever the fish want, minnows, leeches or crawlers. 12 fow has been my depth of choice, have gone as shallow as 4 fow with success. Looking forward to some pan fishing for the next couple of days. Have not seen to many signs of heat stress to the fish, unfortunately if things dont change it isnt to far away". Good luck and be safe. I still have some dates available, Contact Otters Guide Service . (8/2) Bemidji Lakes Area, Paul A. Nelson, Bemidji Area Lakes Guide Service says; "The hot weather continues in the Bemidji area, forcing the fish to feed more frequently to keep up with their elevated metabolism rates. Surface water temperatures remain in the high 70s in most lakes, with a good number of suckers and tulibees beginning to show up floating on the surface of the lakes, casualties of the hot weather. Most lakes have a significant algae bloom, which limits visibility in the water. Many anglers are using presentations that add color, flash and vibration, to help the fish locate their baits with more than just their sight. Spinner rigs have been working well for walleyes, either on bottom bouncers, safety pin spinners or with light bullet or egg sinkers for fishing the shallow flats. Using a quick change spinner clevis allows anglers to switch spinner blades easily, so they can find the color blades that are working best. It is usually a good idea for every angler in the boat to use a different colored spinner blade until a pattern can be established. Many walleyes have been in shallow areas with weeds or moss on the bottom, so presentations that make limited contact with the bottom can help anglers keep from constantly fouling baits with weeds. Anglers should pay close attention to their presentations and reel in right away if anglers think they may have picked up some weeds. There are few things worse in fishing than dragging around a blob of weeds for long periods of time, so checking baits frequently is a must to get more bites and catch more fish. Fishing Report August 1, 2012 Jeff Sundin - Welcome to August, welcome to the Full Moon and Welcome to the first day of a really good, really fun, late summer fishing season. I'm anxious to see how the month unfolds beacuse there are almost always some really great patterns that emerge during August. As the days get shorter, fish begin to enter that pre-fall feeding binge that can really be exciting. On Tuesday, I wrapped up July with another Bass fishing excursion. While it didn't go exactly perfect, it wasn't too bad either and by days end, we'd manage to get a good dosage of action, along with a couple of "highlights" to help remember the trip later. We got off to a shaky start when we followed up on a rumor that there was a new landing going in to a small lake that both I and John Pearson had been interested in trying. 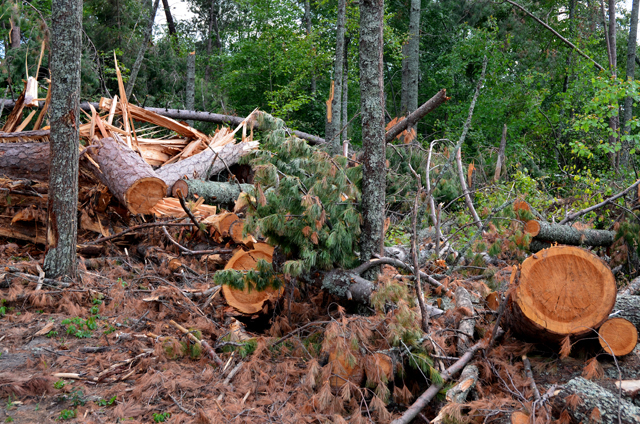 He'd been hearing rumors that (the DNR) had been working on it all summer and it sounded like maybe it was completed. I thought that just maybe, if it would happen to be finished, that we could be one of the early visitors. That didn't work out, we found the spot all right, but the work had only begun and it's gonna be a long time before anyone calls it a boat ramp. Scrambling for a new idea, we headed cross country for Turtle Lake, where the mixture of Largemouth, Smallmouth, Pike and Walleye would surely provide enough action to keep us entertained, and it did .... almost. There were just enough fish biting to keep us thinking that we were on the verge of having good action. But after a half dozen spots that provided spurts of one or two fish at a time, I got nervous and pulled the pin on this visit. Before we left though, the lake did reward John for his effort. I had spotted a school of fish on a 30 foot deep hump, they were either Walleye or Smallmouth, maybe some of each. We dropped all of our plastics and rigged up our Lindy Rigs, snapped on some Night Crawlers and trolled the hump. 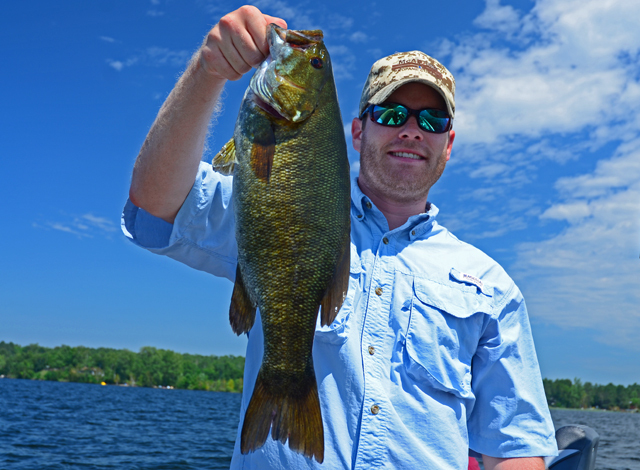 It took some doing, but John did manage to trick one really nice Smallmouth Bass. A couple of more passes through these fish yielded a couple of half halfhearted pick ups, but not the kind of action we were looking for. Next, I decided to play it safe and head back toward Grand Rapids and familiar water. Largemouth Bass had been cooperative last week and I hoped that they'd still be on the prowl. This stop worked out a little better, but even here, the super warm, 80 degree water seemed to have the fish scattered hither and dither. We had some moments of glory, especially Oscar who took a trip up the learning curve, figured out how to get the most out of a Wacky Rigged YumDinger and the kicked his Bass catching career into high gear. I had a nice run too; Using the same worm, a 6 inch Green Pumpkin, rigged Texas style, I picked up the stragglers that were holding deeper, in the 14 to 16 foot range. By the end of the afternoon, I'd guess we caught 25 Bass, maybe half of them came from the Bulrush edges and the other half from the deeper weedlines. Luckily, the boys were in their top form on Thursday. While we didn't catch any wall-hangers, we did manage a dozen nice solid fish for their trip home. Zach Dagel has been finding Northern Pike and Lake Trout out there and he's figured out how to catch 'em too. All you need to do is ...... Read Report Here . Bill Moore above, and David Moore below share memories of the old days as they make new ones for tomorrow. There's just something nice about that! .... and then there's Sean Moore, starting his own list of fishing memories from the spot out in front of "The Greek's Place". Not bad! Jon Thelen illustrates how to use planer boards and line counter reels to place his spinner rig at the correct depth and distance from the boat while targeting suspended walleye. 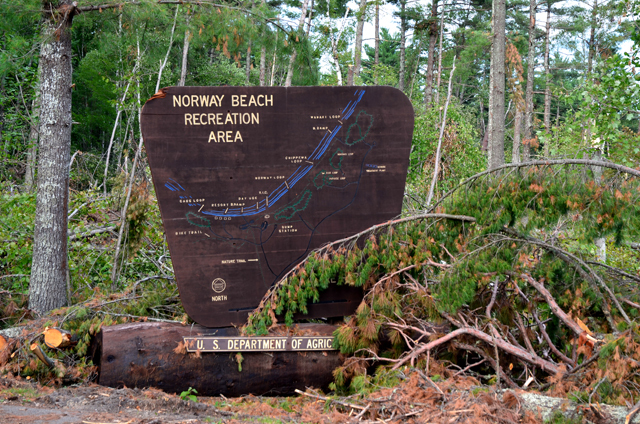 The recent storm hit hard at Cass Lake's Norway Beach. Luckily, time heals, and this spot, one of the Itasca Area's most precious gems, is going to become beautiful in a whole new way. Heat stressed lakes are showing signs of a summer kill. Tulibees, Suckers and eventually game fish could fall victim to the warm water. 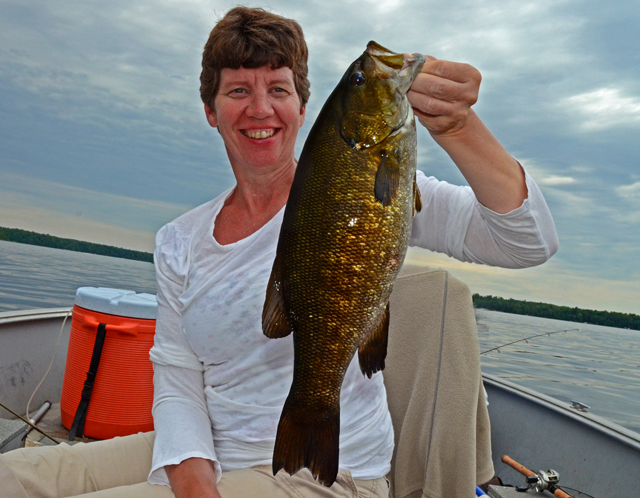 Smallmouth Bass were scattered and we seldom caught more than 3 or 4 fish in a spot. But, almost every move yielded a few more fish. A good time to be Mark Derryberry! Fishing with a 1/16 Lindy Jig and night crawler combination has been reliable. Try fishing the jig, like it's a Lindy Rig and you'll be smiling too! 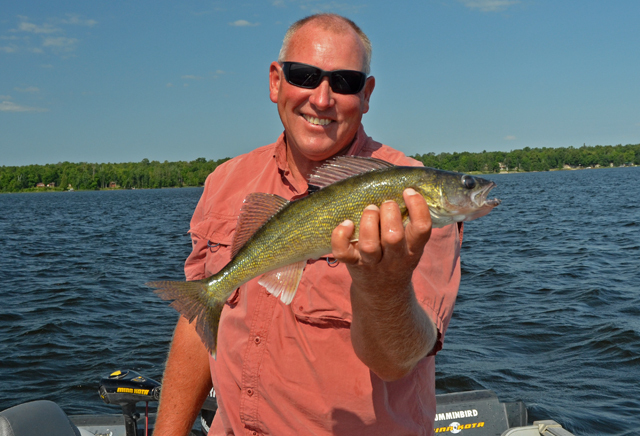 Walleye action in the Itasca Area has been reliable. A variety of trolling approaches on a variety of lakes means that your favorites are probably producing too! It was a good day to be Kyle! Largemouth in the morning and Smallmouth in the afternoon. Drop-shot rigs would be a good choice for Smallmouth that are holding in the 14 to 20 foot range. Loving Leadcore! Travis Sorokie, Sauk Rapids, got into the walleye leadcore scene this spring and has already spent hundreds of hours experimenting with it and catching fish, a LOT of fish. Click to Learn More. Speaking of Walleyes in the weeds, Jon Thelen has been scoping out some weed spots too! 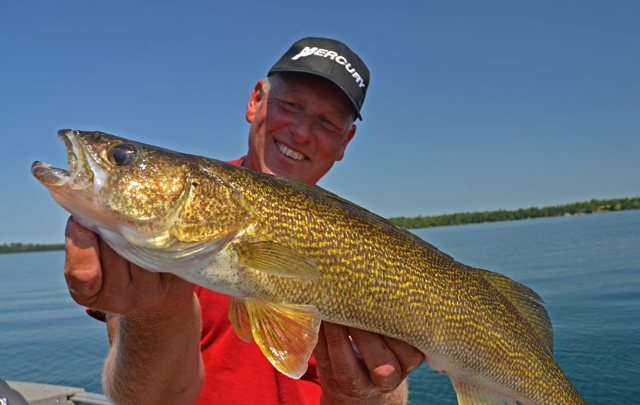 Check out This Week, Weedline Walleyes. Mary wouldn't pose with the fish, so Brian gave it his best effort, next time Mary, Next time! Once in a while, the worm makes it to the intended destination, cheating small panfish and Bass out of their snack. The classic mixed bag scenario. Panfish and Bass riding over the grass and out, over the open water edges. Walleyes holding deeper, just outside the weedline. The trick? Get the bait in front of the Walleye before all of the panfish find it first! Thanks to a breeze that kicked up a nice Walleye Chop, Walleyes were on the move. We didn't bag any lunkers on Wednesday, but we managed to bag some premium size eaters. This week on the water, Jon demonstrates mid summer tactics for roaming crappies. Courtesy Gus' Place Resort, Ball Club Lake. 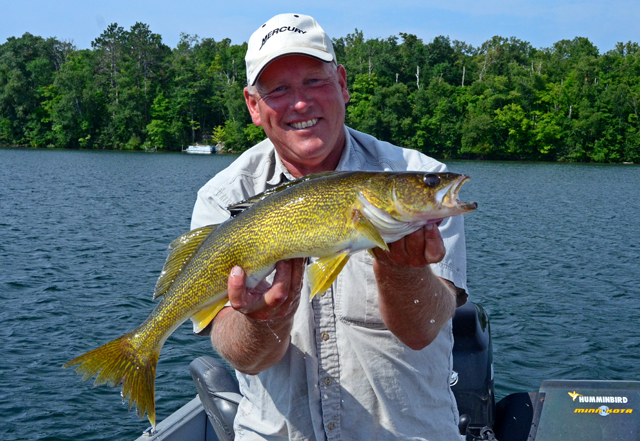 Gary S. shows off a 28 in Walleye that he caught, photographed and released. Gary was using a Lindy Rig, Leech combo. Fishing with jig and Night Crawler combinations, we picked up Walleyes at a steady pace. When the goal is getting your string stretched during mid summer, the recipe for mixed bag fishing should be deeper, clear water lakes that turn on later than the shallow, Walleye factory lakes. The lions share of our action came from Largemouth Bass, but Smallmouth, Walleye and even a couple of Muskies made appearances throughout the day. (7-6) Multi Species anglers welcome this time of the season. 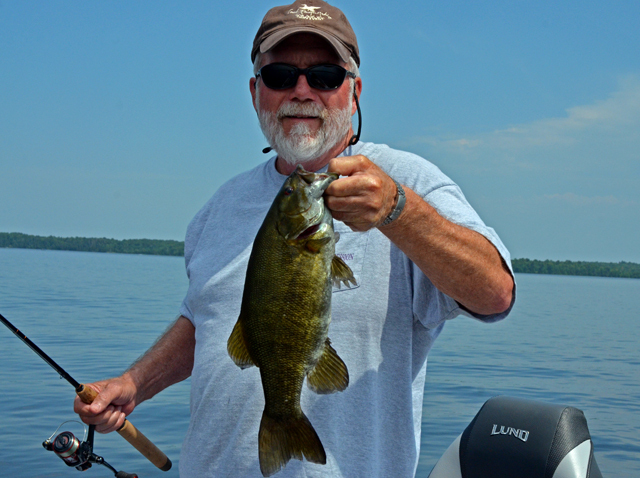 Deeper, cooler waters turn on and the weedlines fill up with every kind of fish in the lake. Bruce Champion admires a nice pair of fish, CPR's from the same weedline. (7-3) Thanks to Randy Hertle's super positive attitude and insistence. We managed to squeeze in a little fishing on Tuesday afternoon. This time the Walleye were a little more cooperative. Grant Hertle definitely approved! (7-3) The view from my back yard on Tuesday morning. 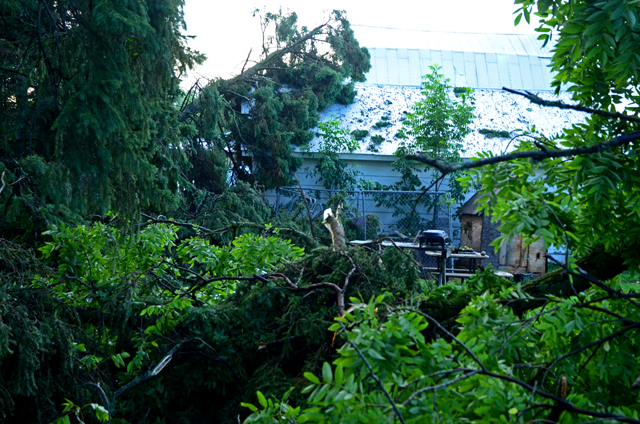 Looks like a good excuse to do some landscaping! 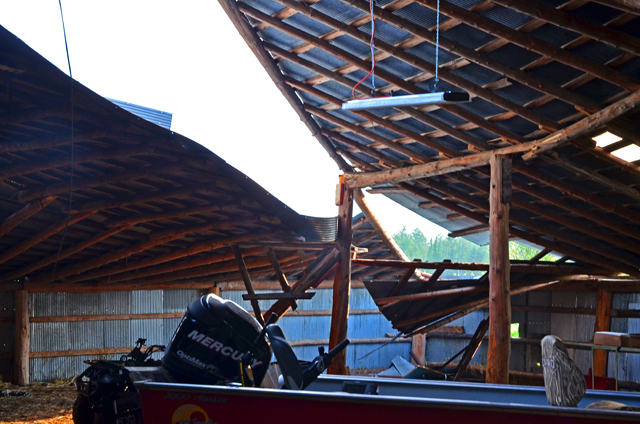 (7-3) Unbelievable, but the boat sat unharmed as my barn fell apart all around it! That was really lucky too! We patiently worked jig and crawler combiations, teasing Walleyes until they finally struck. In clear water, sunshine slows down the action, but doesn't have to stop it. For me, there's something about working harder at something, that makes the experience even more rewarding. Just a little bit of extra water at Pokegama Tioga Beach landing ramp. Look close at that little pipe, just down from the front tire, that's the dock! It was a good day to be Mavis Jones! Quality over quantity was the goal and she proved that she was up to the task! Oh, and by the way, so was "TheLunker Hole"! Keeping up with Jones'? No Problem! Mavis Jones (above) shows off what happens when you got the positive vibes going. Brother in law, Neal Jones (below) said; don't try to understand 'em, just set the hook and land 'em! 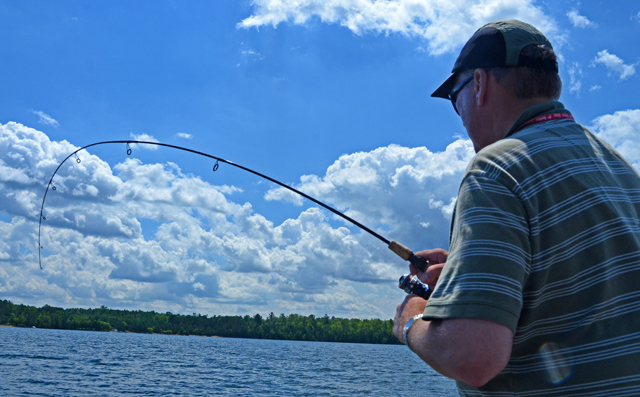 Shallow water, summer Walleye patterns are emerging in the Itasca Area. Bruce Champion shows off what happens when you flip a jig and night crawler into 8 feet of water. At times, we'd find small schools of fish that would provide spurts of action. Upper edges of the shallow breakline were best. Some little suprises along the path too! Fishing for Walleye, a couple of Smallmouth Bass and even a Redhorse Sucker decided to join the party. Hey! "You better get over here, looks like this is gonna be good!" Jim Luhr said; "That's My Boy!" as another first timer, College student, K. Luhr bagged his first ever Walleye on Tuesday. Not bad, not too bad at all! Fishing mid lake Walleye structure with spinners is the real deal! Jon Thelen is an expert at "draggin blades" and this week, he's got the video to share his secrets with you! For Jackie (above) and 16 year old daughter, Annie (below), the goal was easily set and turned out to be even easier to achieve. Neither of them had ever caught a Walleye before, but we fixed that! There were a variety of fish. Rock Bass, Perch, Northern Pike, small Walleyes and even a Redhorse Sucker. The hodge podge required us to pay attention to every single bite, catching, sorting and gleaning the odd, Walleye as we fished.